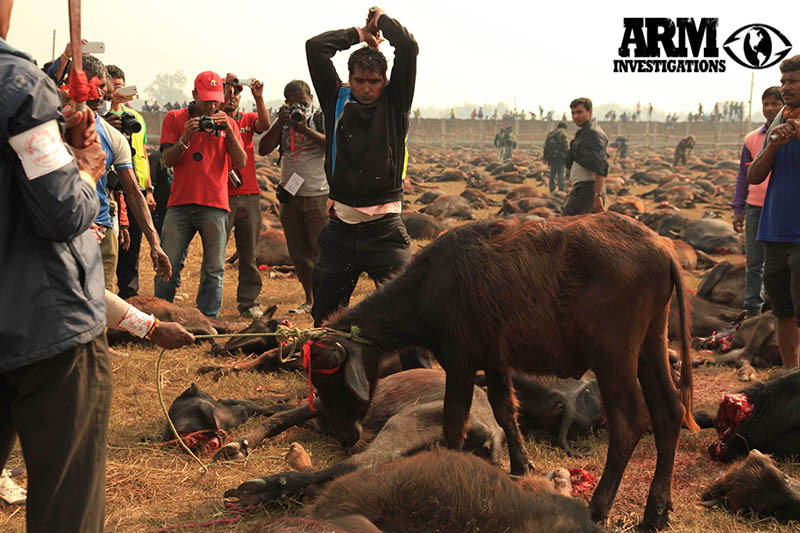 Following ARM’s indepth investigations of an influx of animal religious sacrifice cases, ARM recieved dozens of pleas to assist in appealing this years Gadhimai Festival in Nepal, known as the largest animal sacrifice festival in the world. 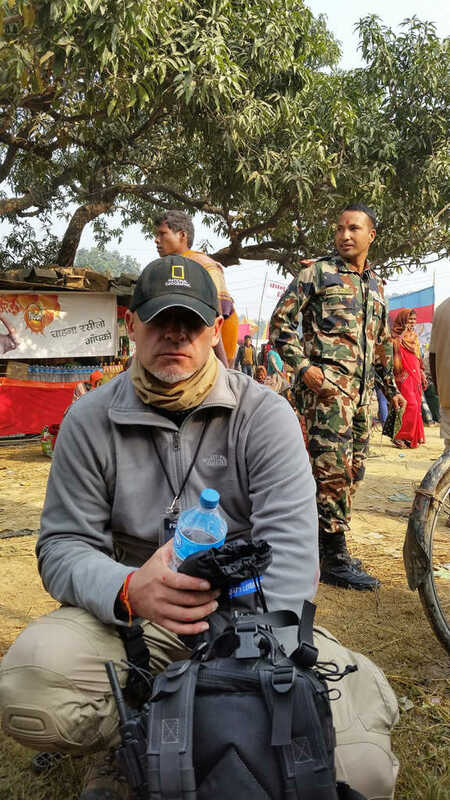 In true fashion of the ARM’s vanguard methods, the organization decided to embark upon a gruelling ten day trip half way around the world, to document ‘first of it’s kind’ footage of the savage ongoings of the festival. 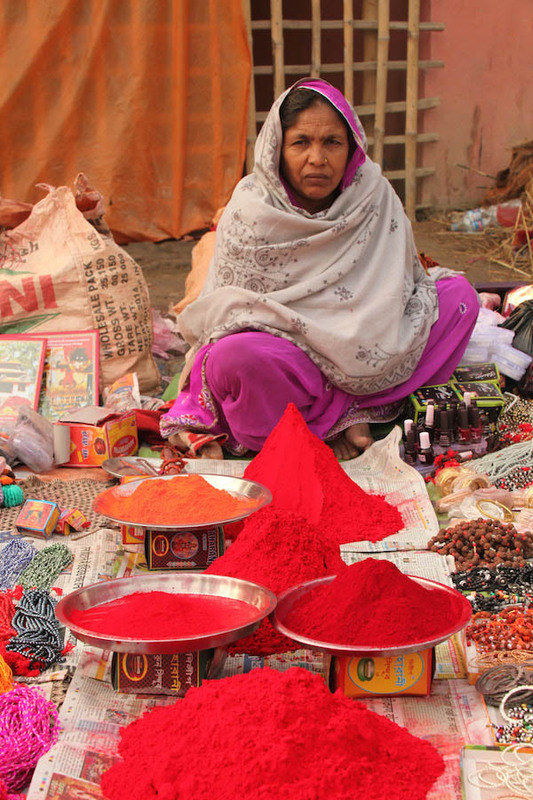 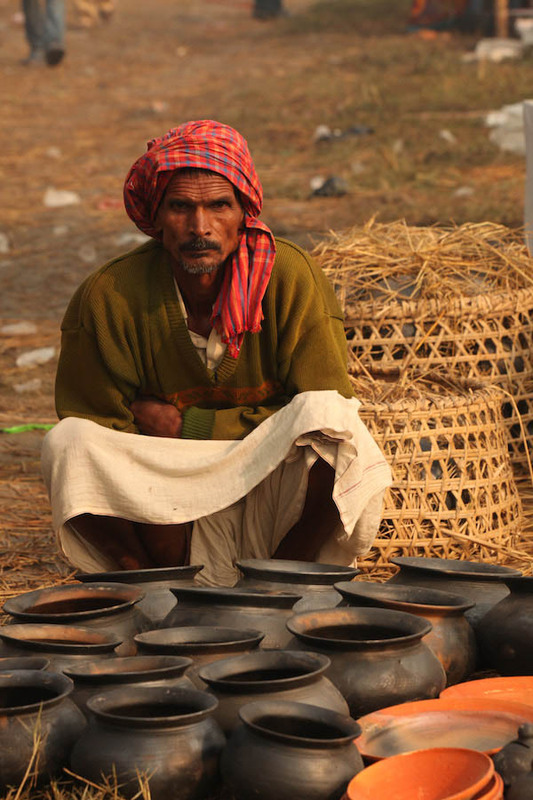 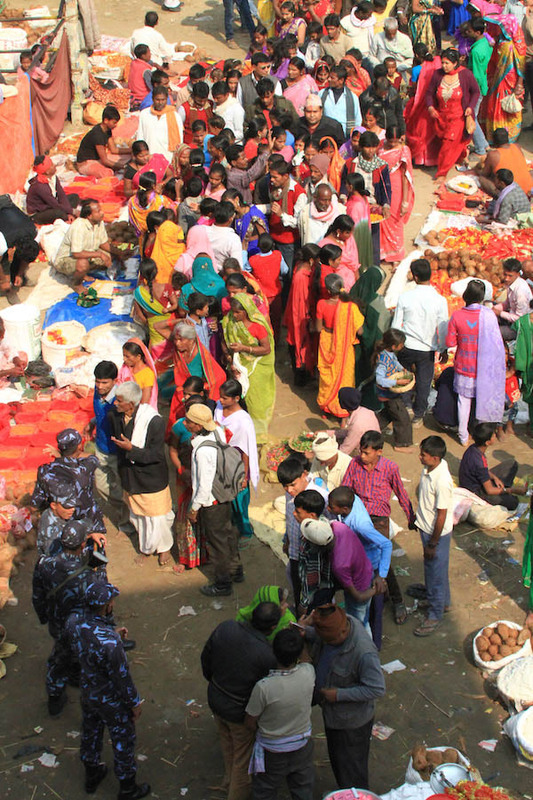 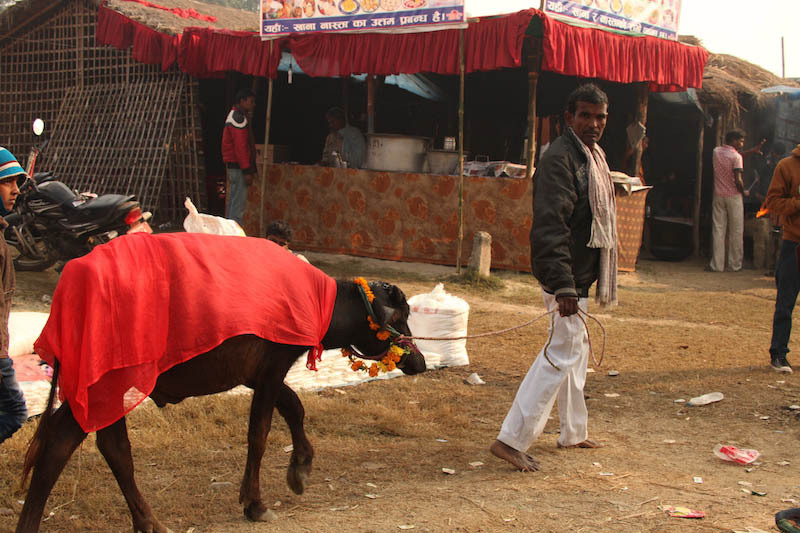 The Gadhami Festival is held once every five years and has been a tradition for over the last 250 years. 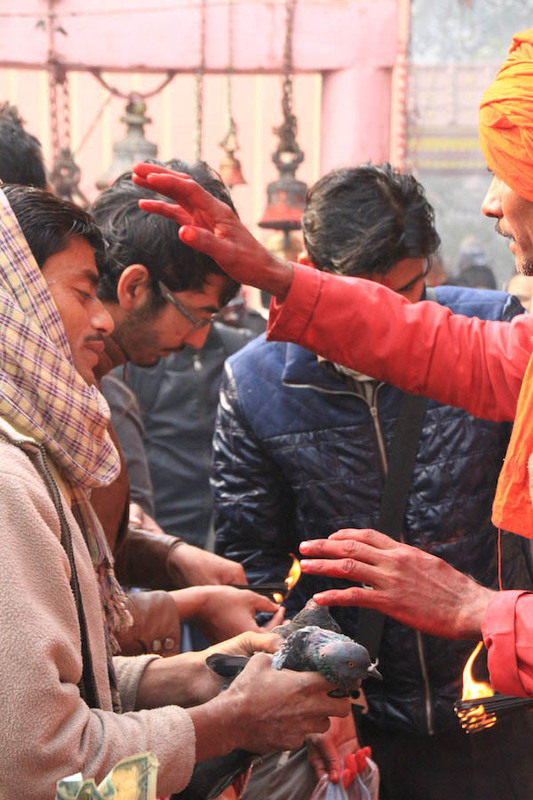 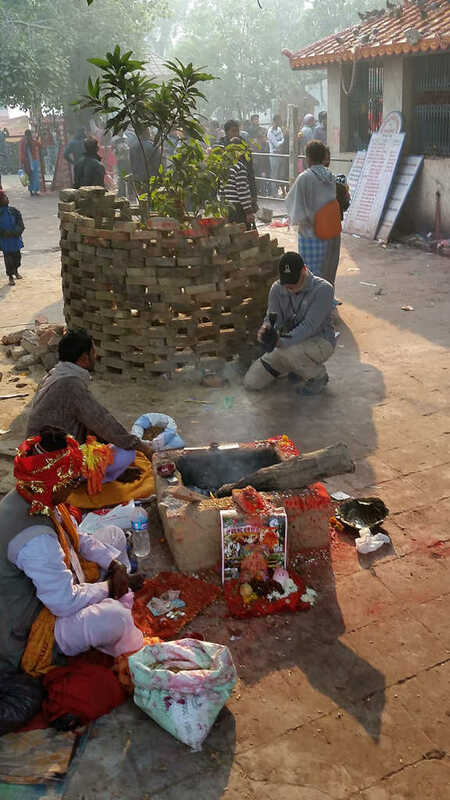 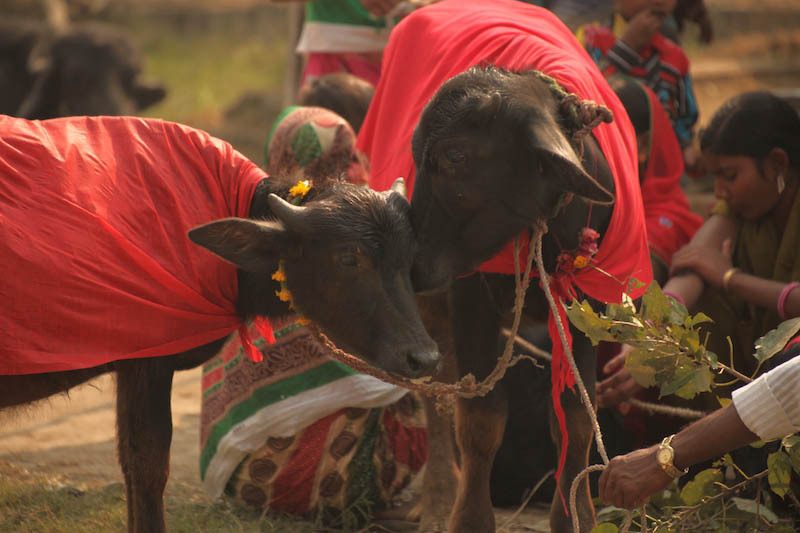 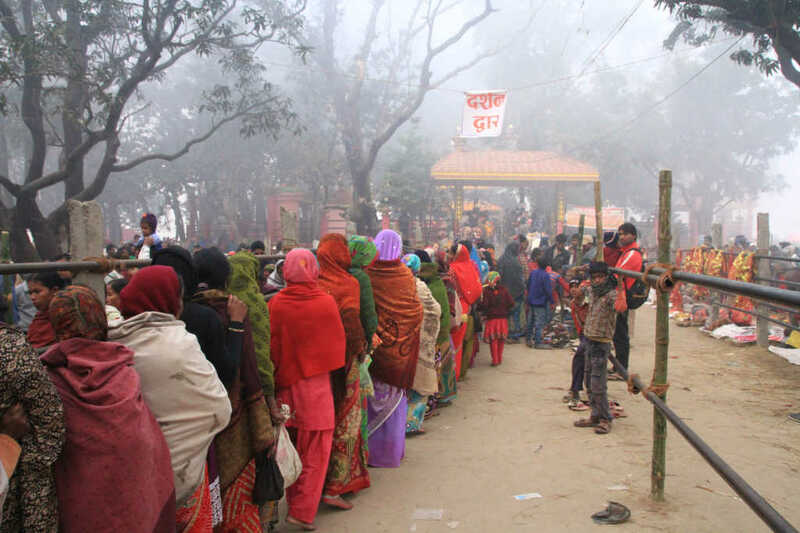 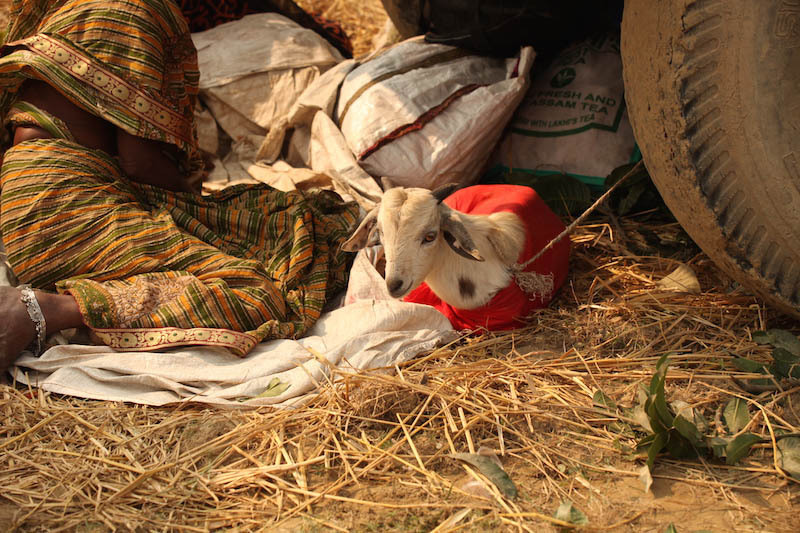 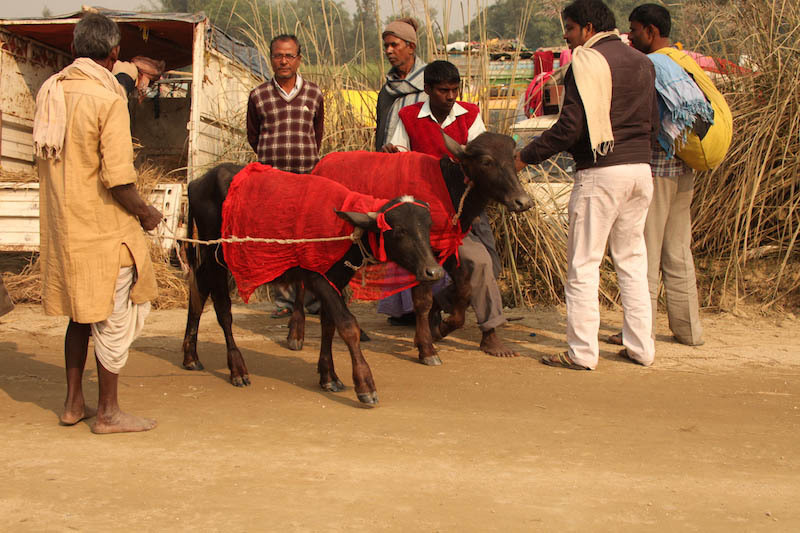 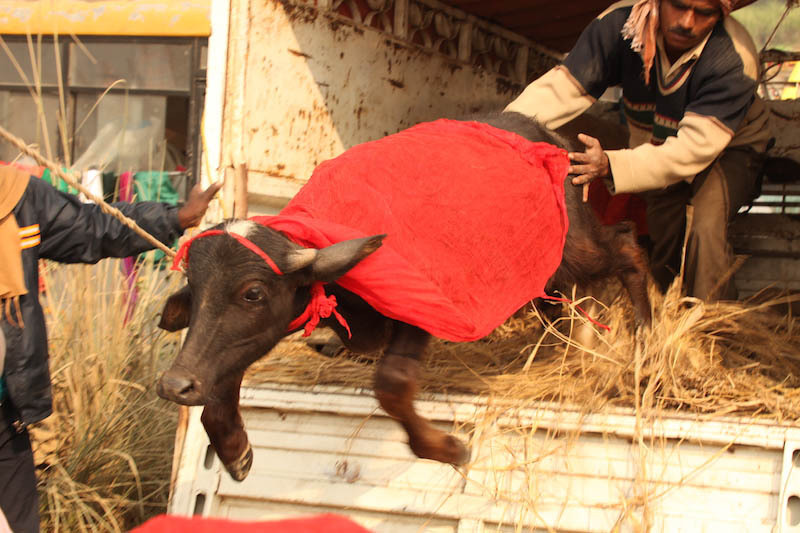 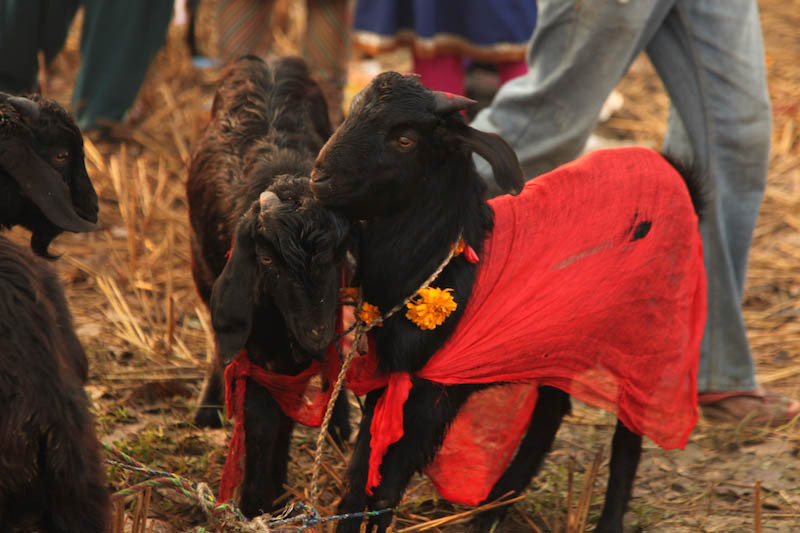 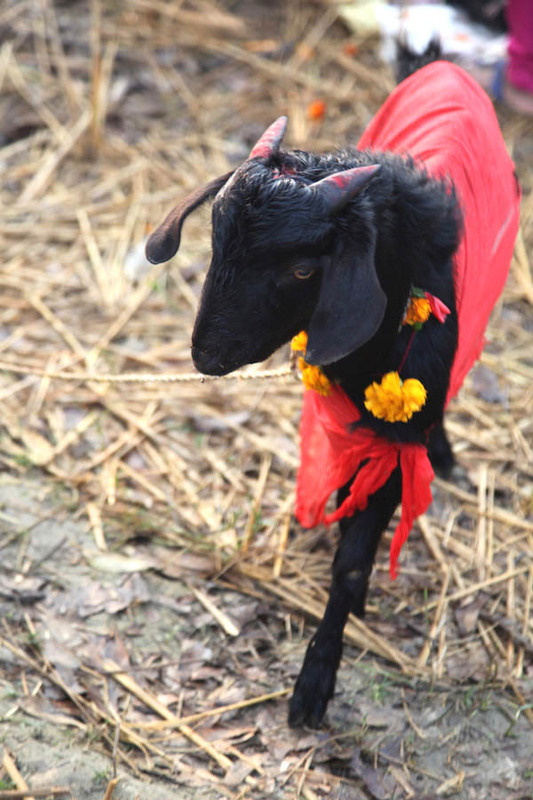 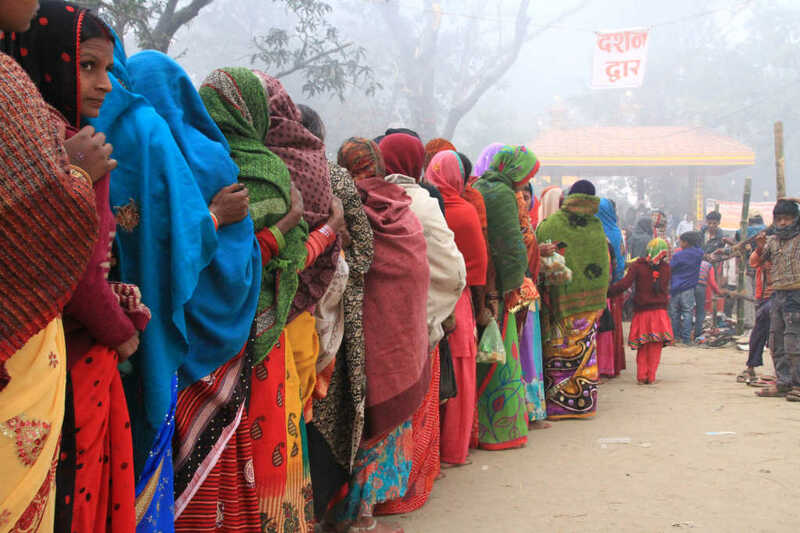 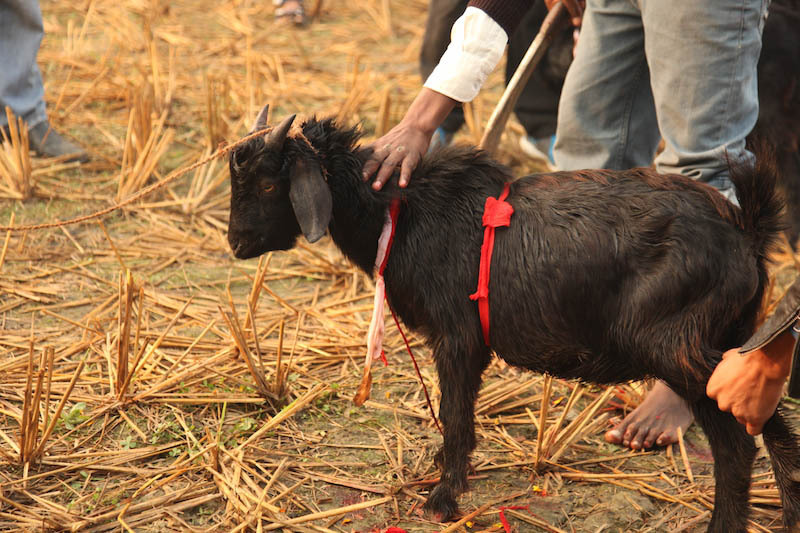 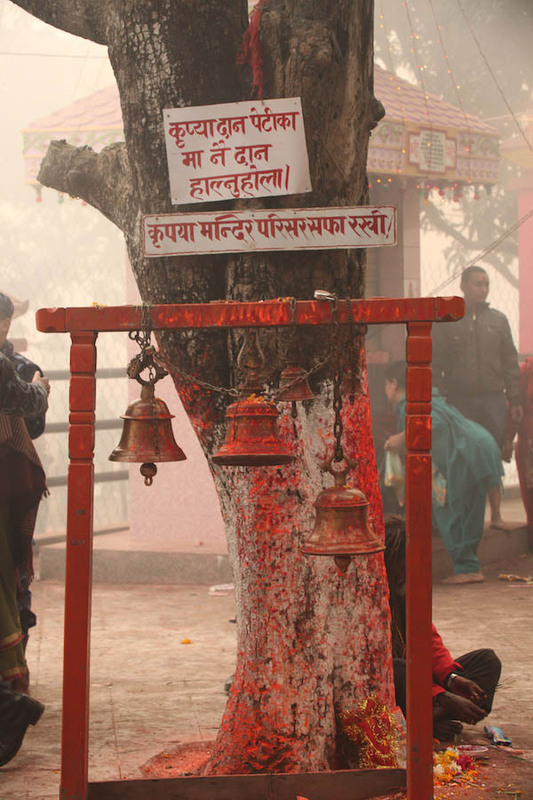 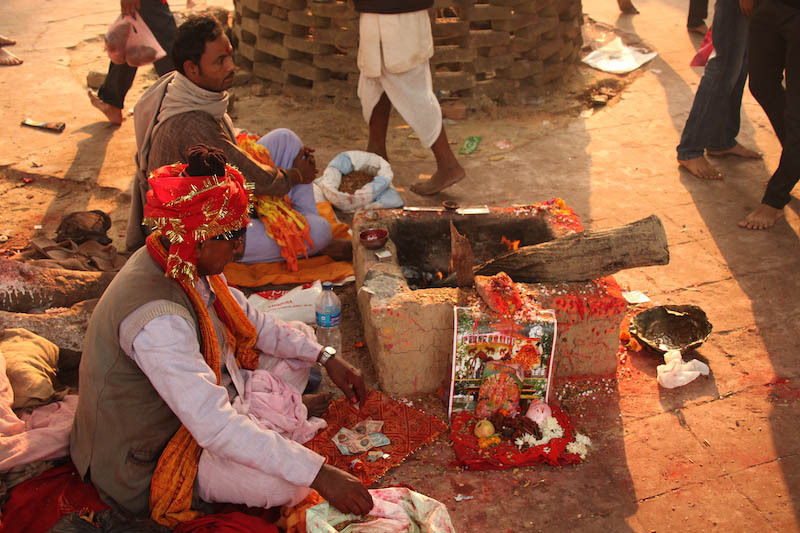 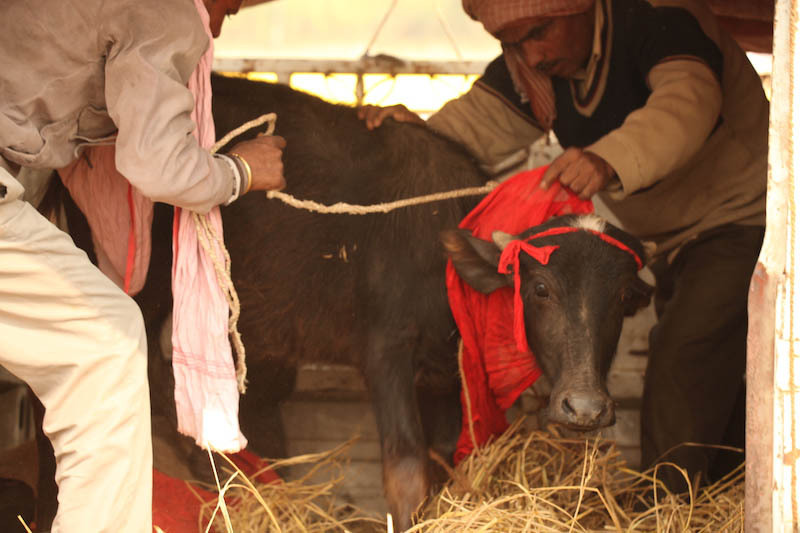 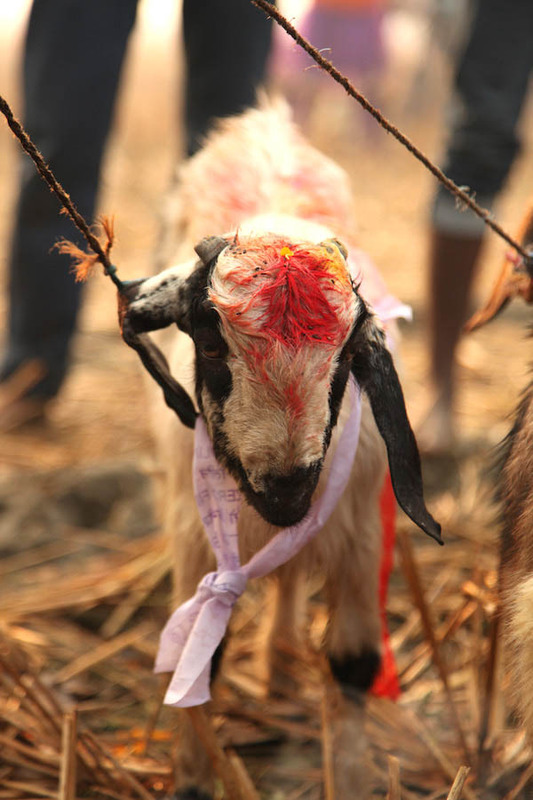 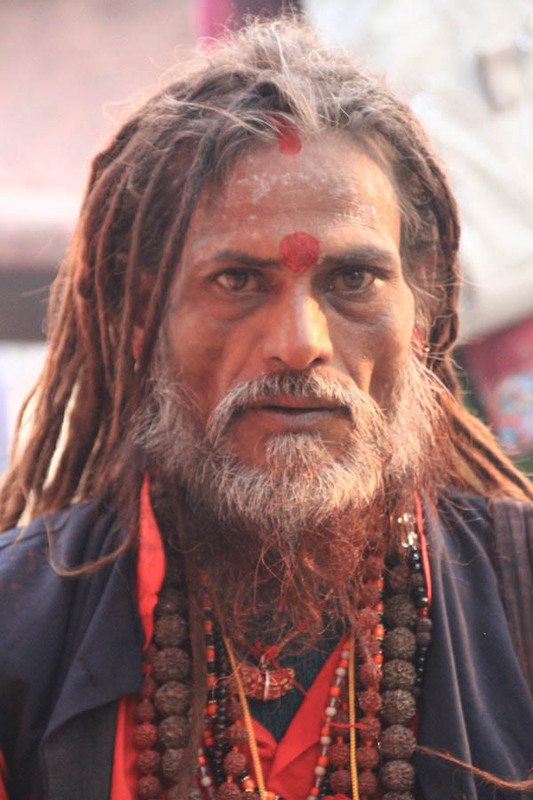 Pilgramages from across Nepal, and as far abroad as India, are made by devotees wishing to offer their animals to the Goddess of Gadhimai, in hopes to fulfill their desperate wishes, end any evil in their lives or bring prosperity. 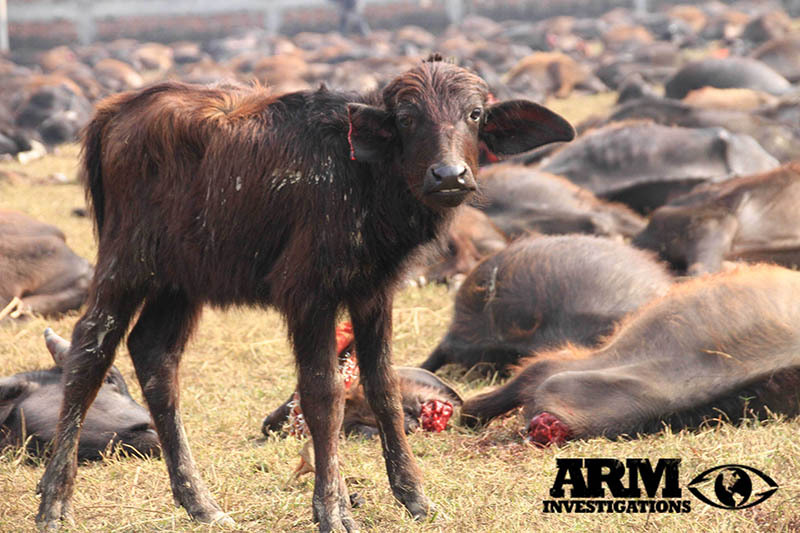 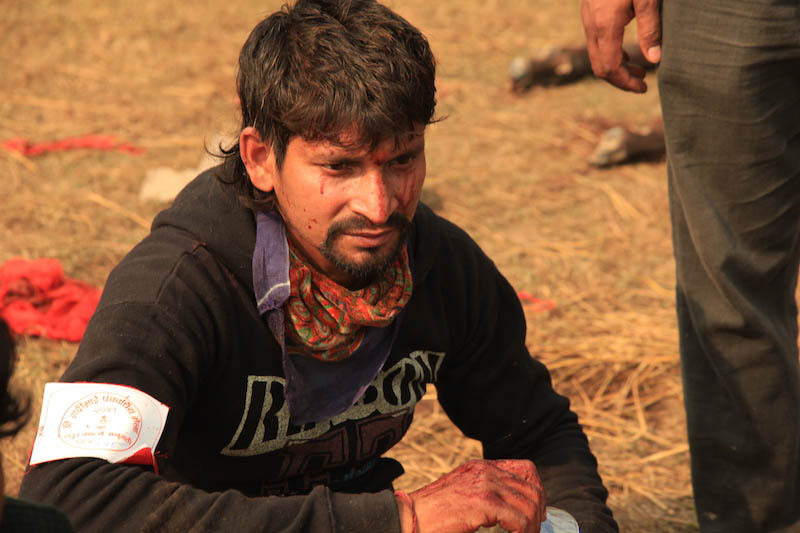 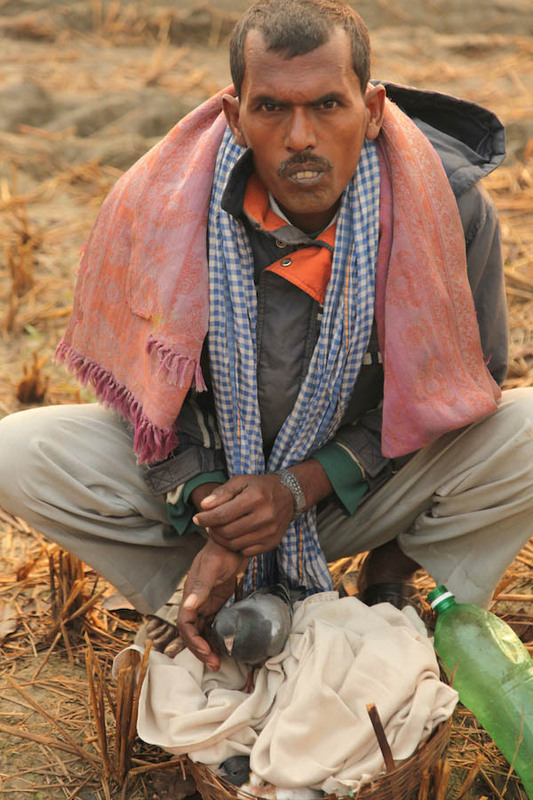 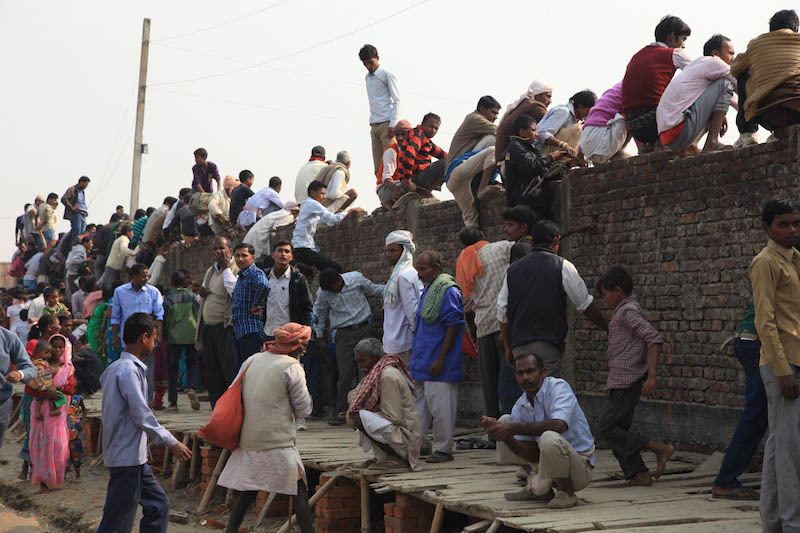 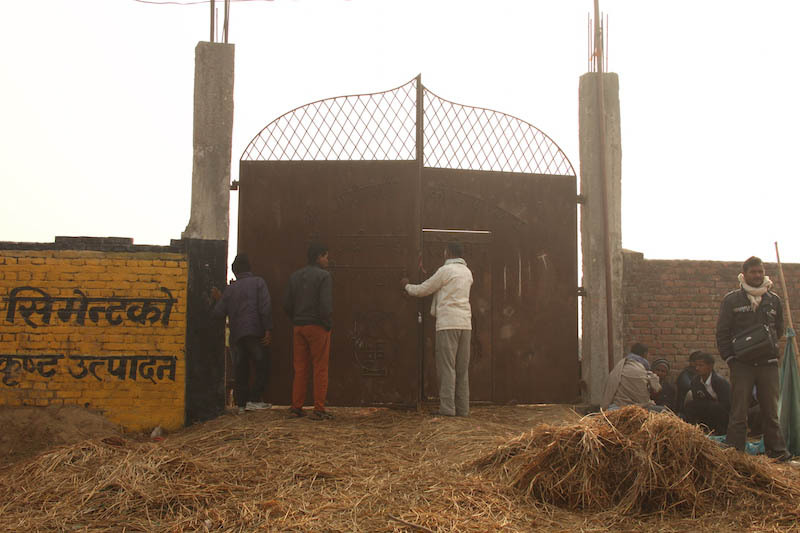 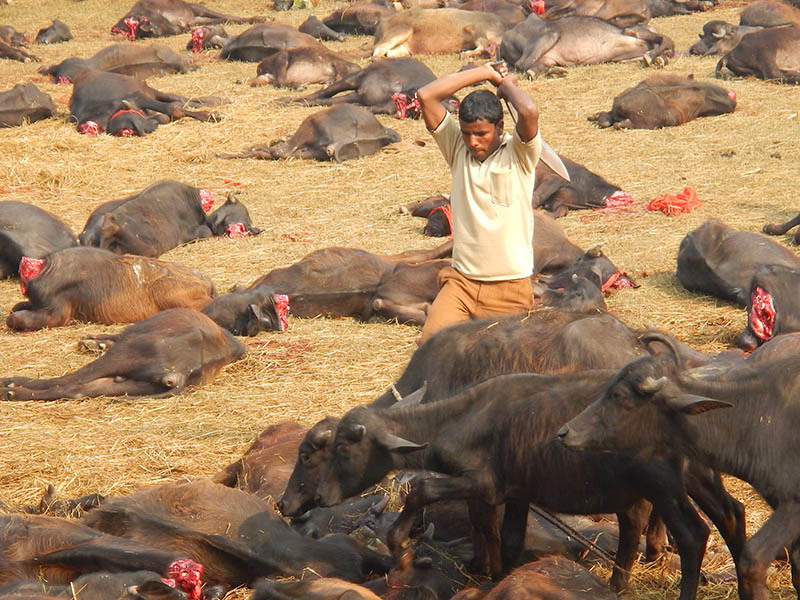 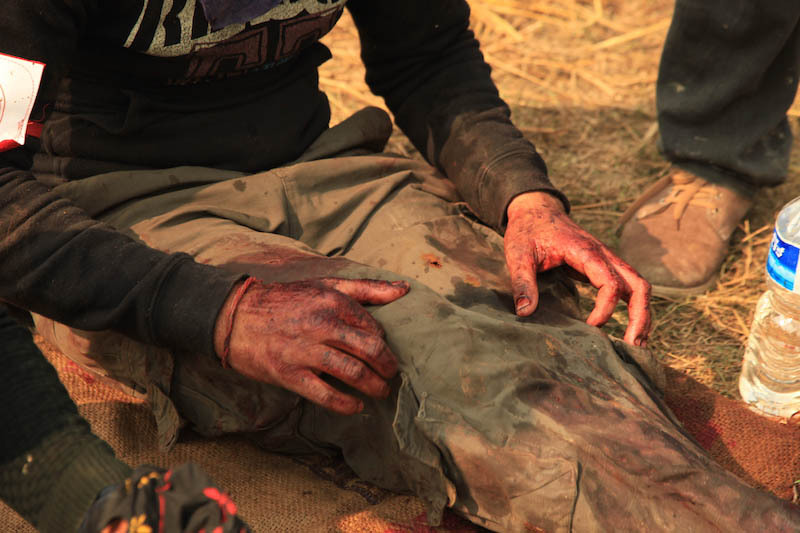 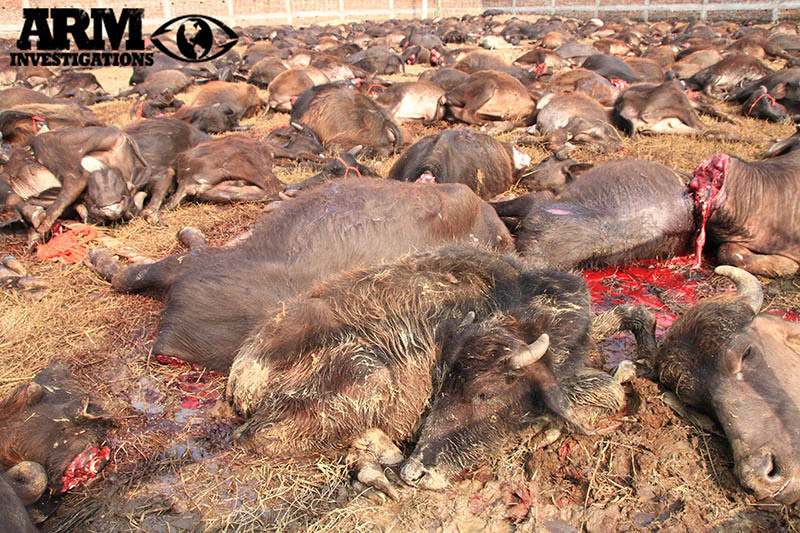 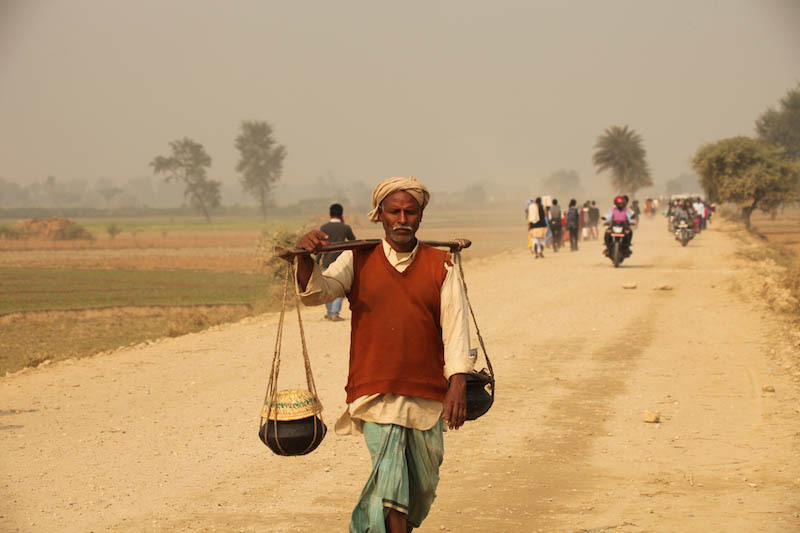 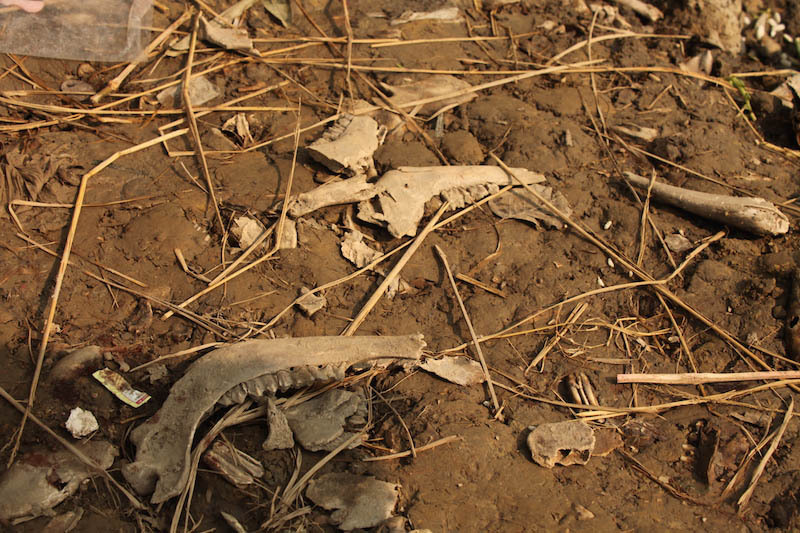 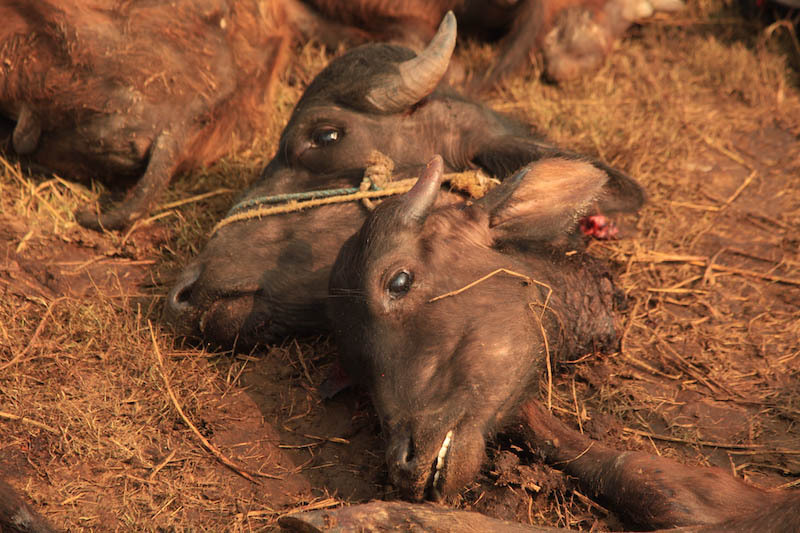 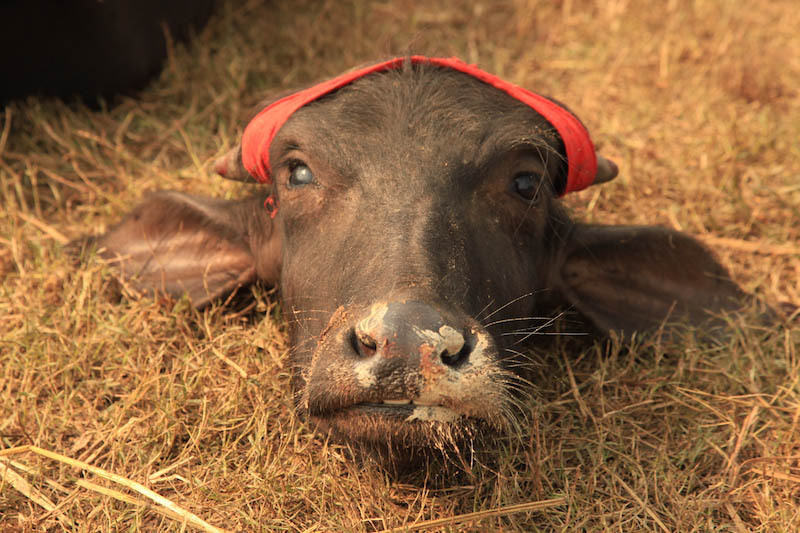 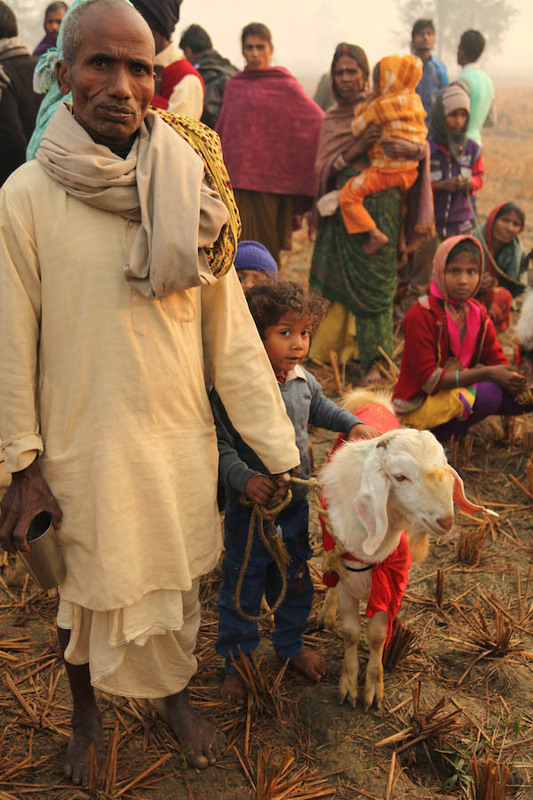 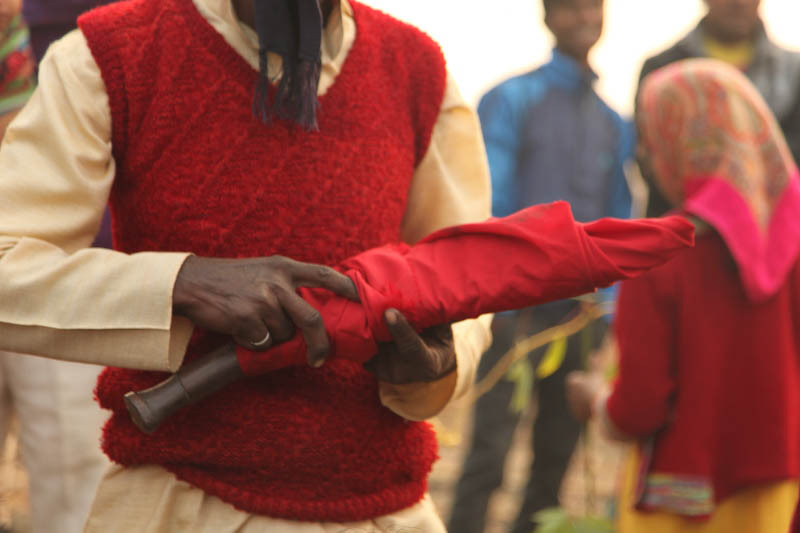 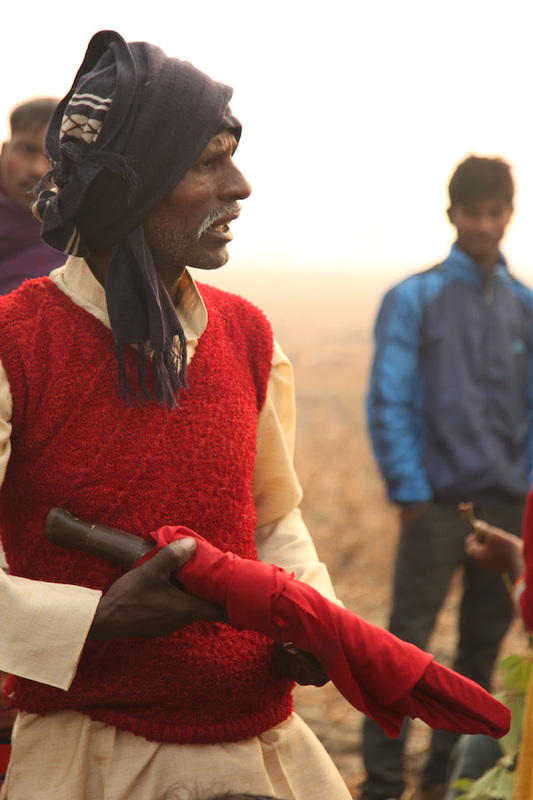 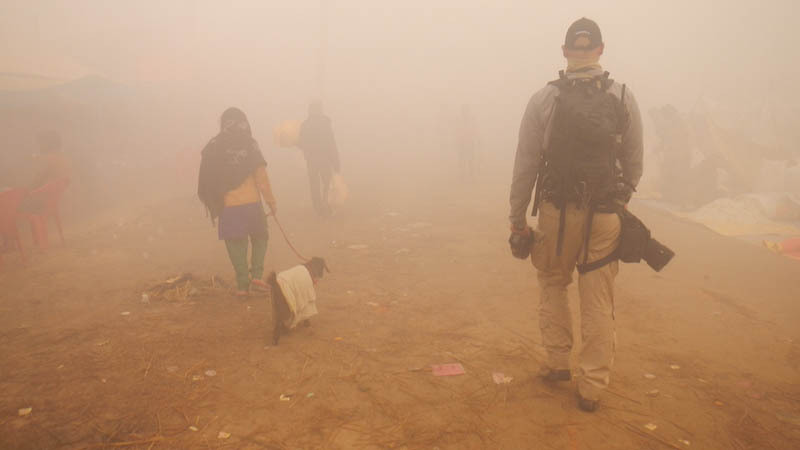 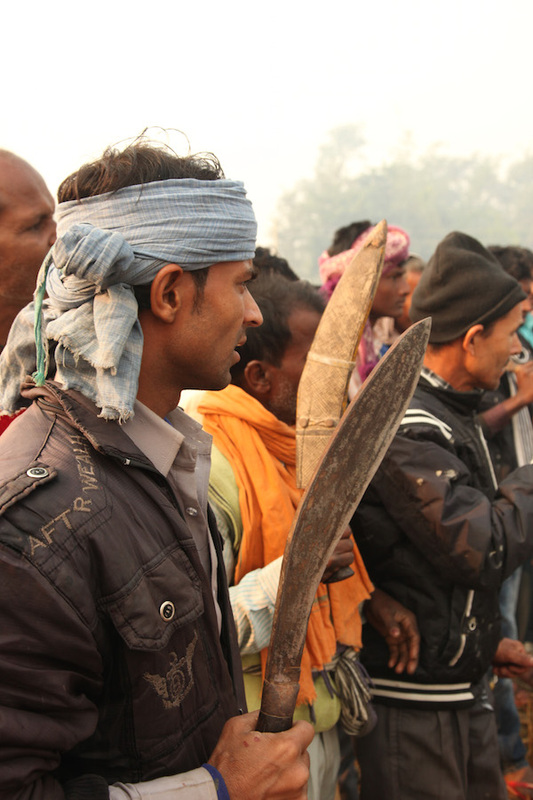 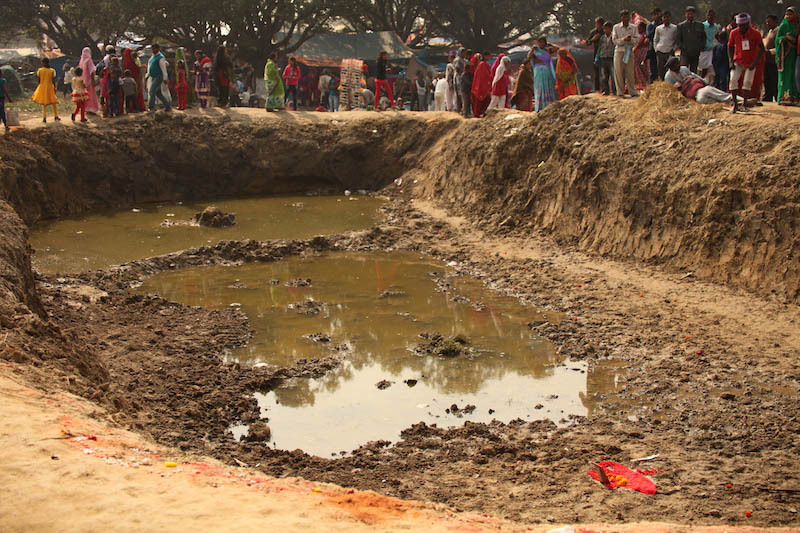 ARM Investigators were the first American based animal cruelty investigations organization to go undercover and infiltrate into the Gadhimai Festival, located in Southern Nepal, where thousands of buffalo were subjected to an extremely merciless killing spree, held over the 28th and 29th of November, 2014. 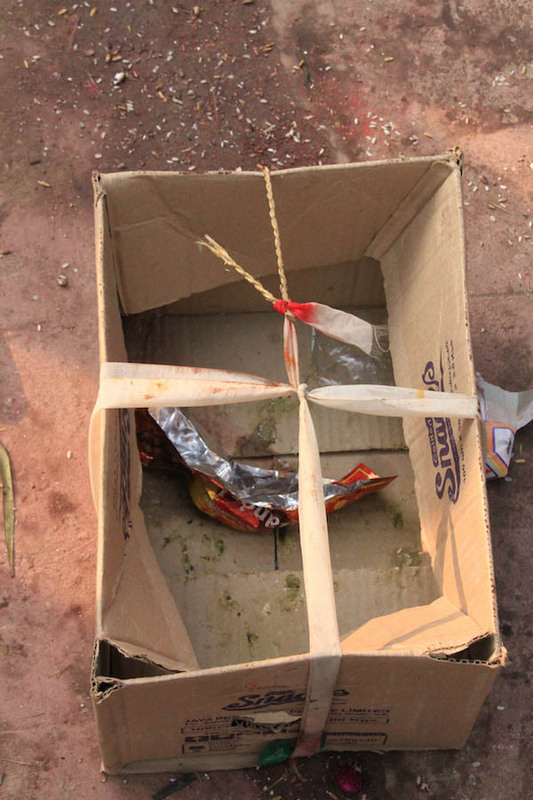 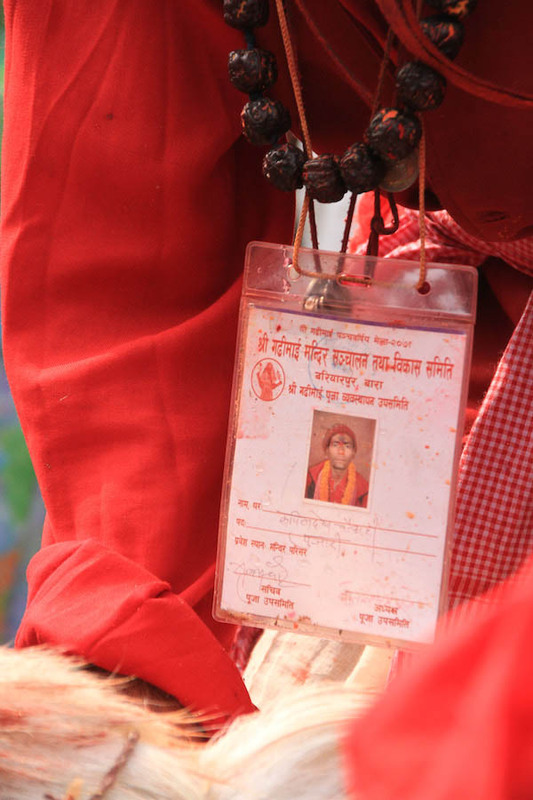 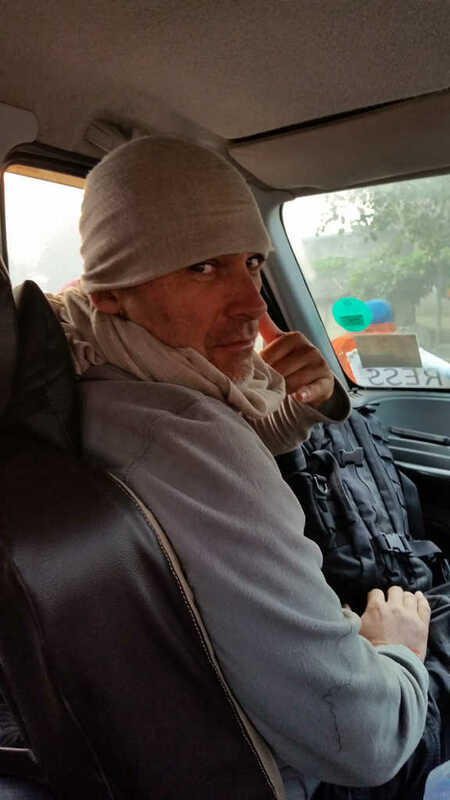 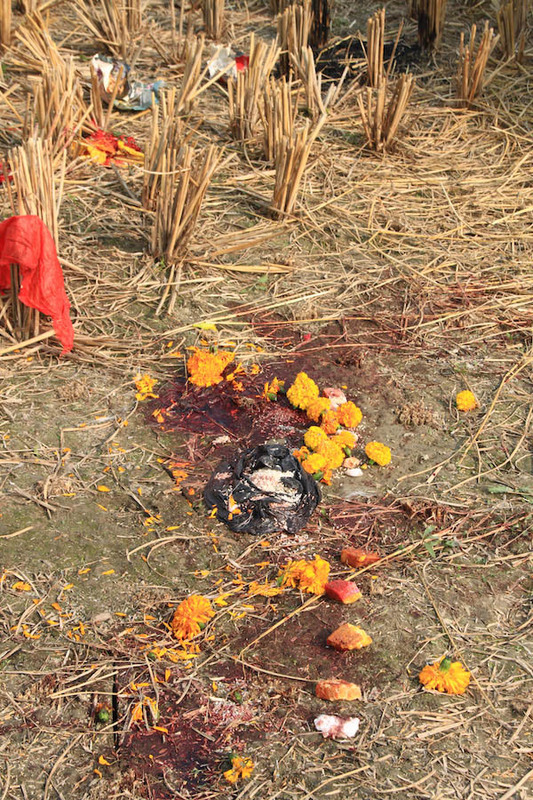 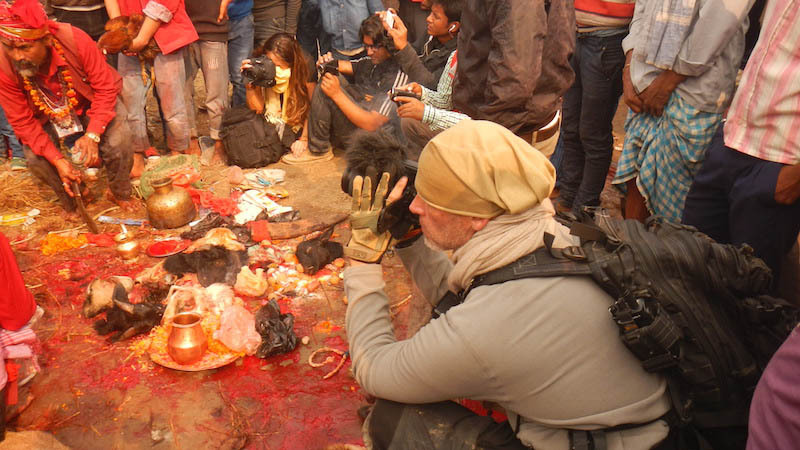 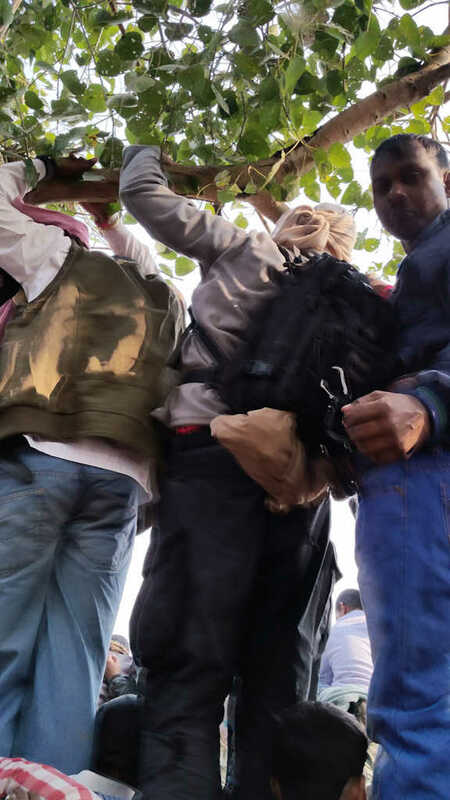 In addition, Investigators ventured outside of the temple’s perimiter into the outskirts of the India-Nepal border to obtain exclusive footage and documentation of multiple sacrifices that took place simutaneously to the main event. 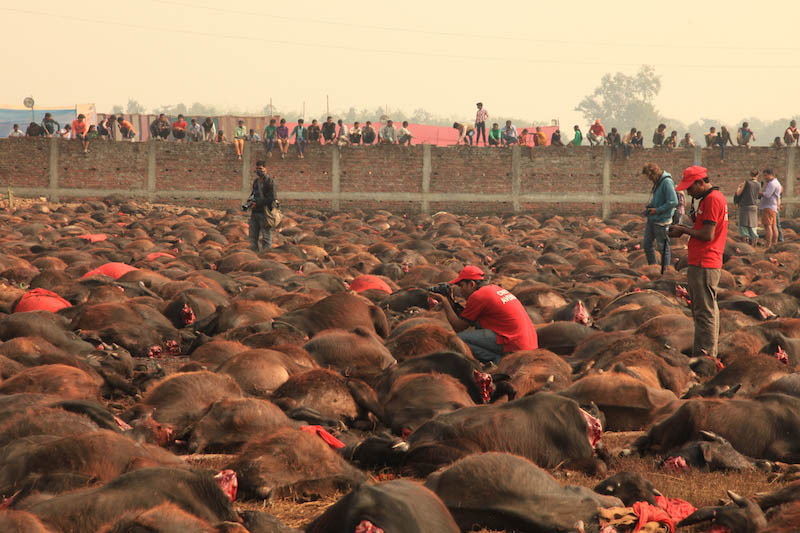 A total two million people made the pilgramage to the festival this year where an estimated half of a million animals (double that of the last festival) were brutally tortured and slaughtered. 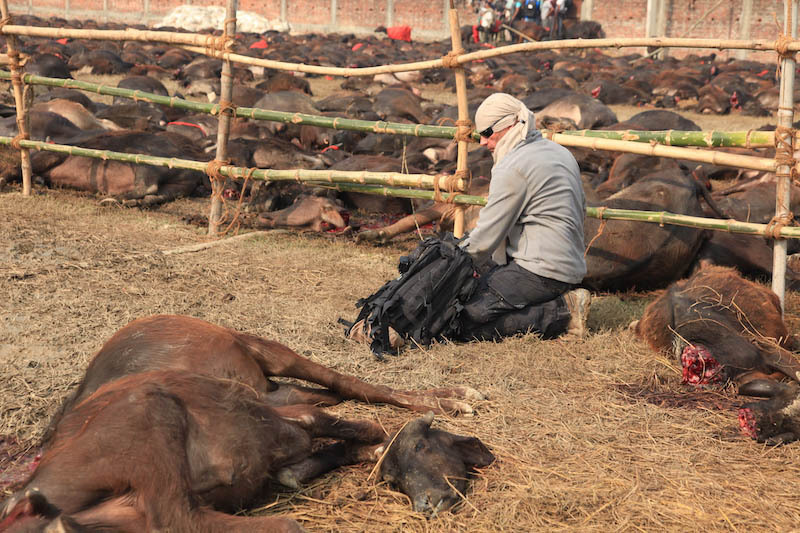 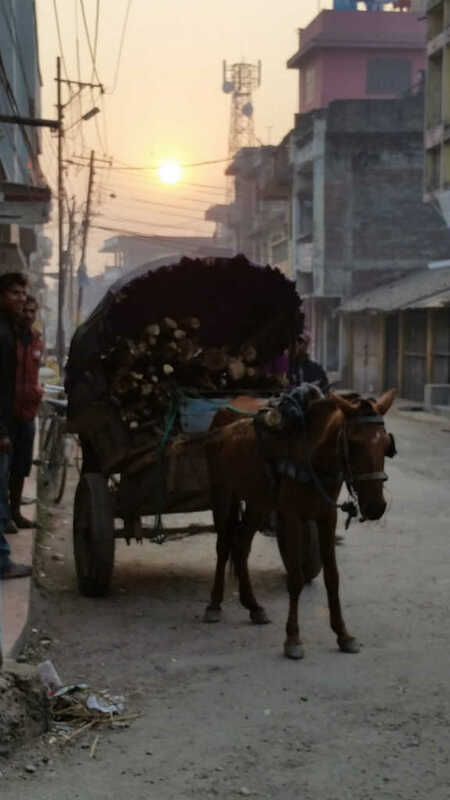 A large percentage of animals were half dead from sheer exhaustion and lack of food and water after concluded the long haul to the village of Bariyarpur in the Bara District of Nepal, 100 km south of the bustling city of Katmandu and 20km from the border of India. 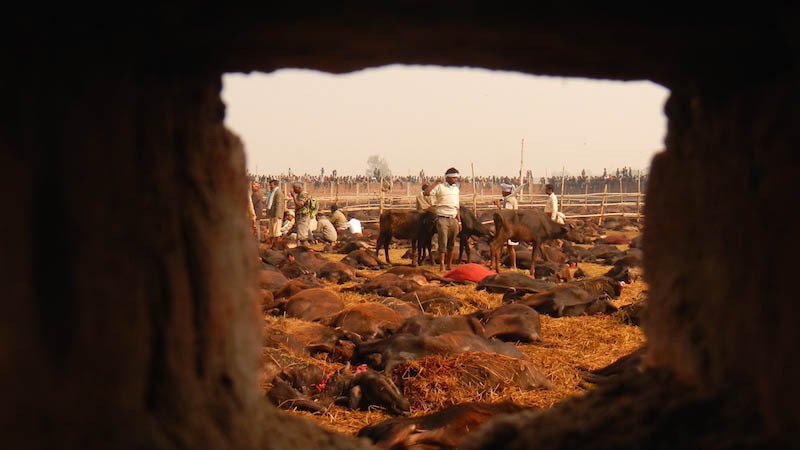 ARM investigators witnessed up to 5,000 buffalo who were sentenced to untimely, gruesome deaths who had been contained behind a stone walled field leading up to the massacare. 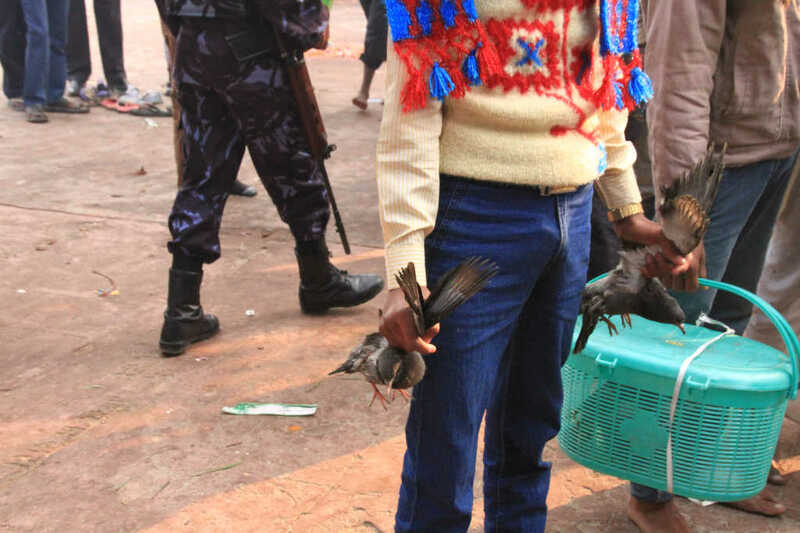 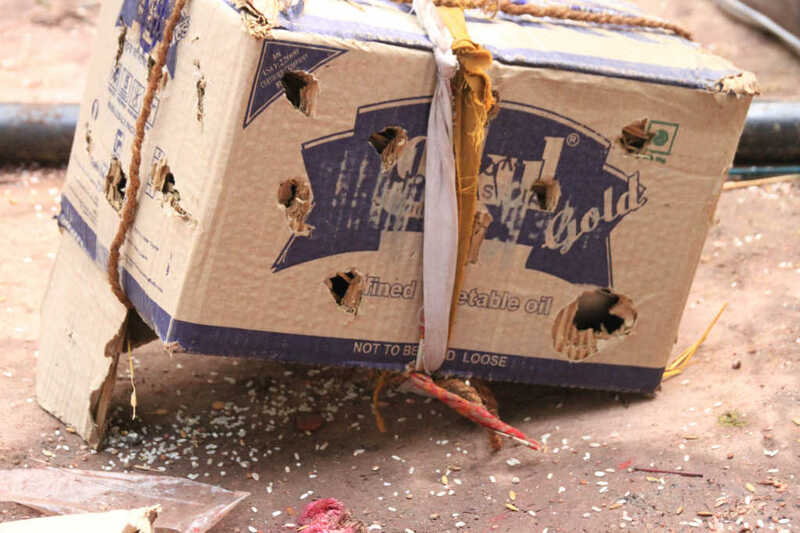 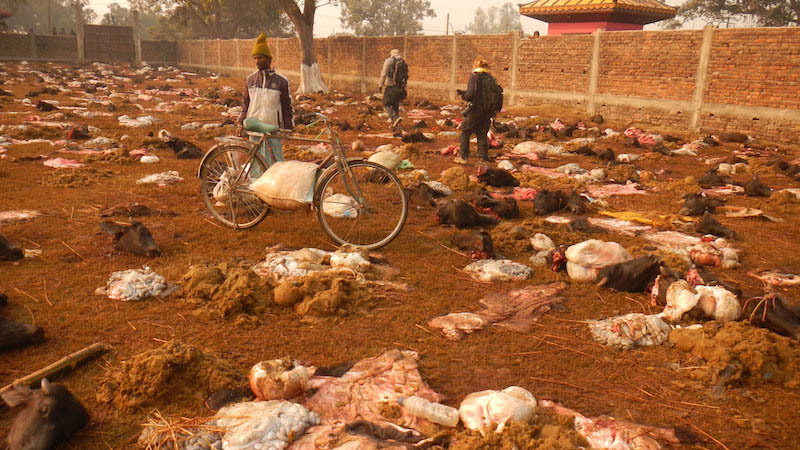 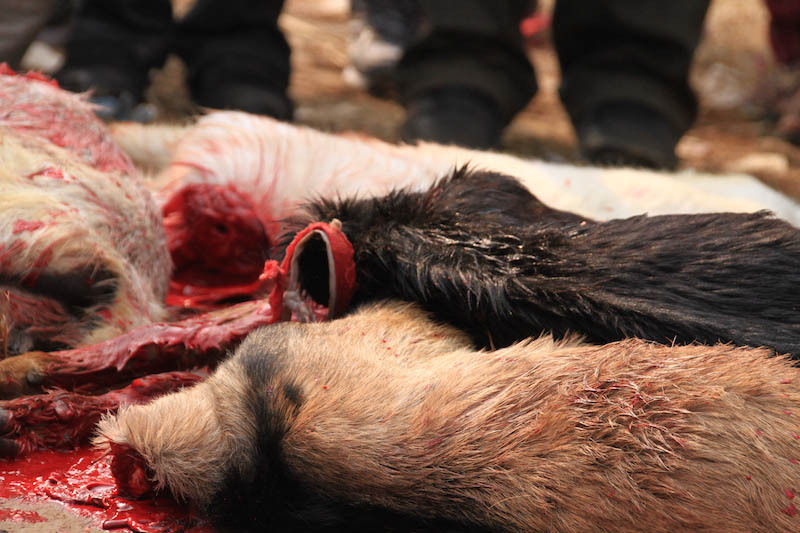 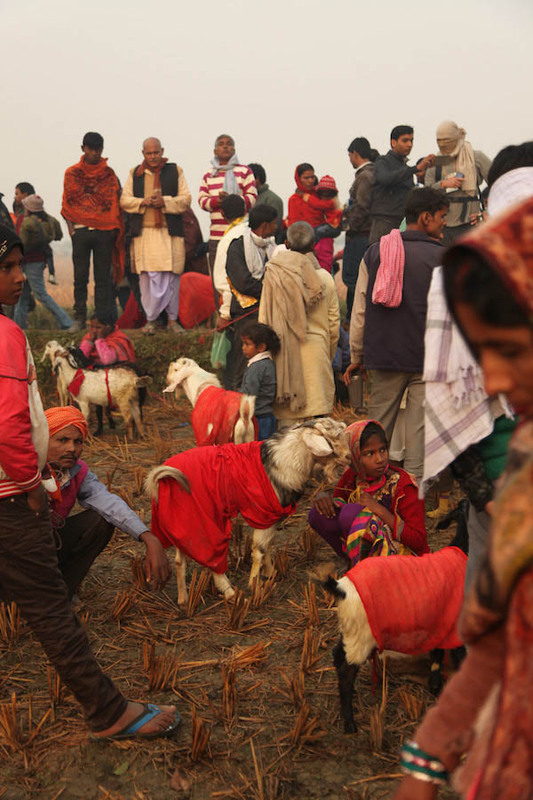 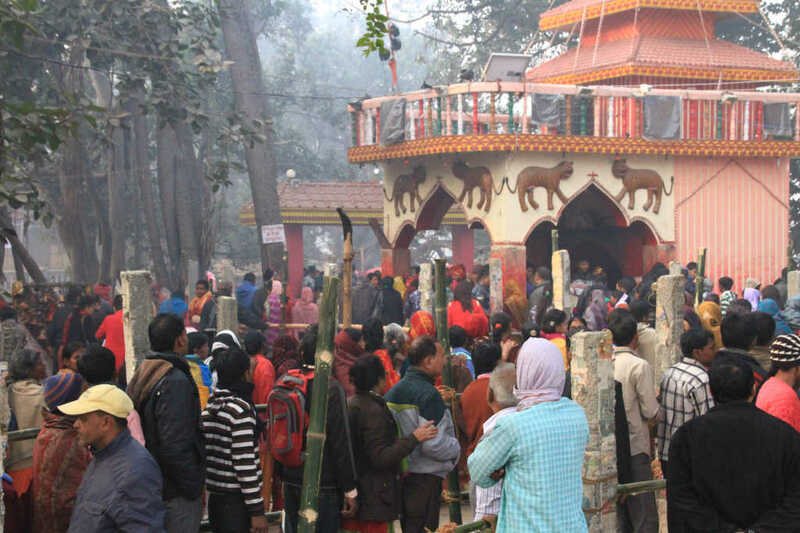 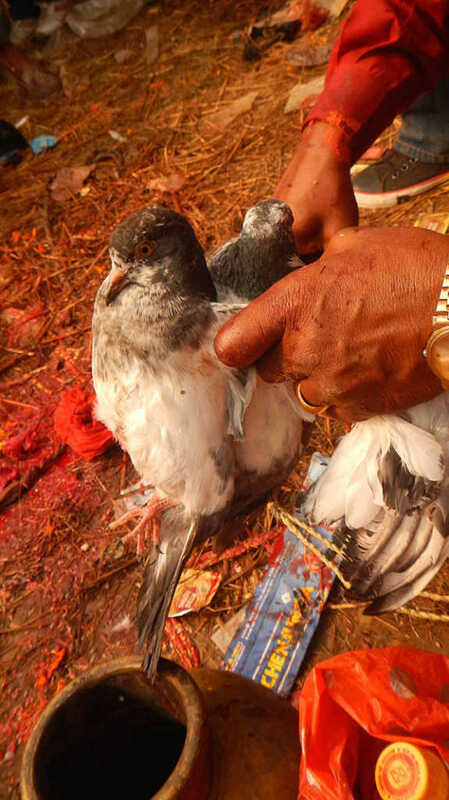 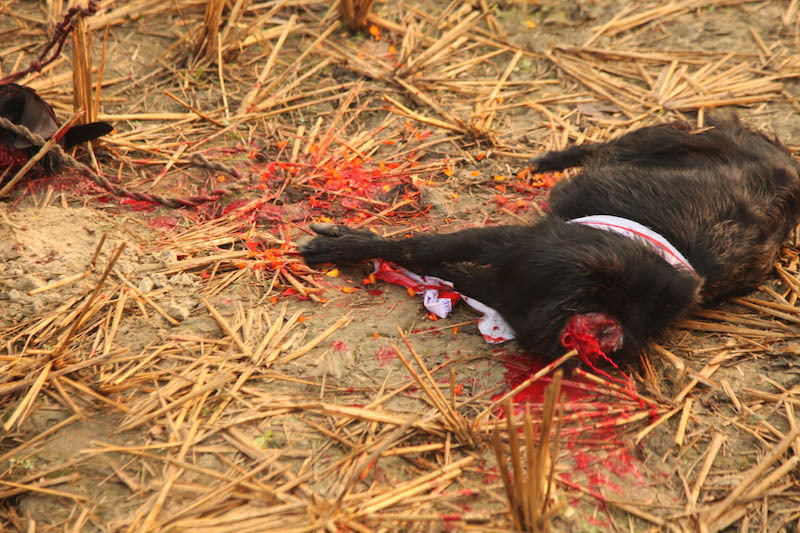 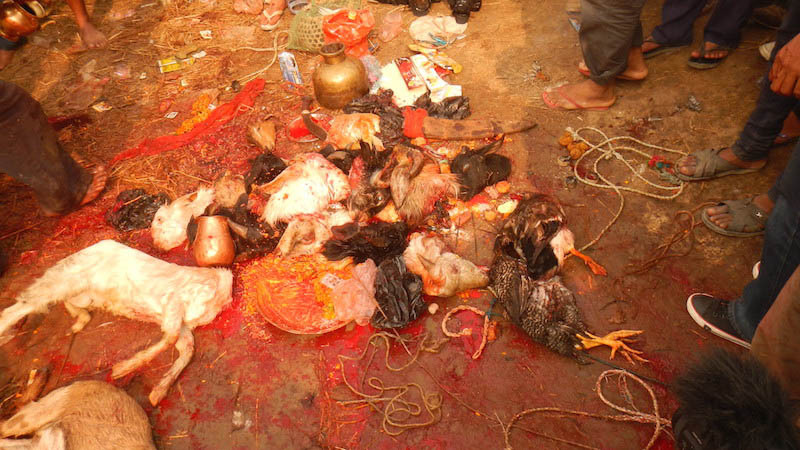 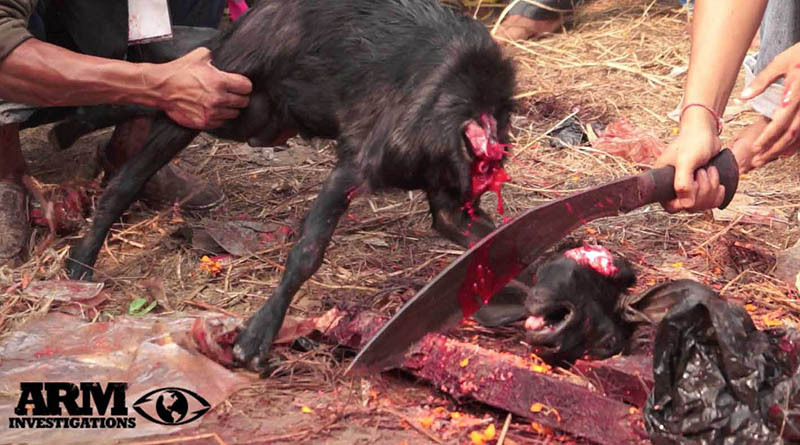 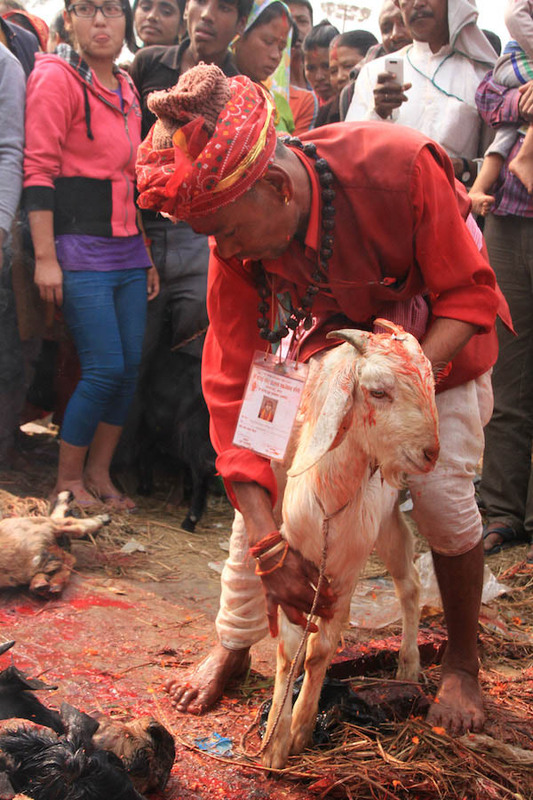 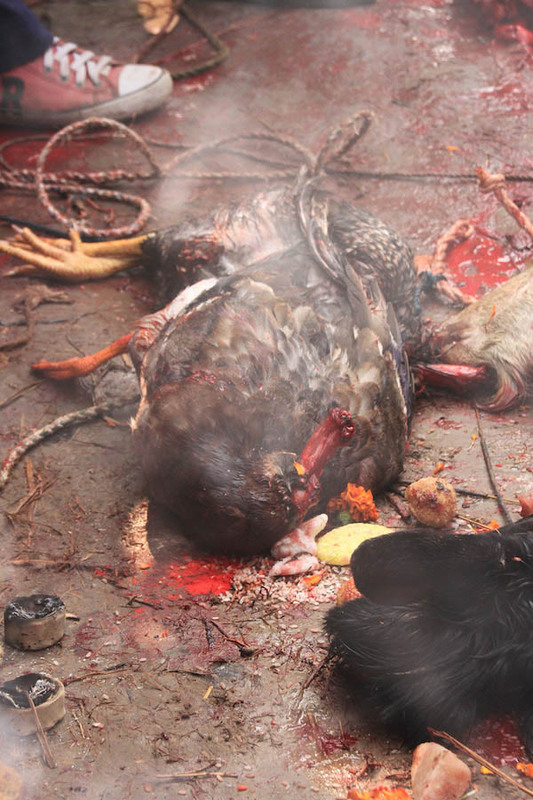 Other types of animals including goats, roosters, ducks, pigeons and baby calves were slaughtered barbarically around the Temple perimeter throughout the festival. 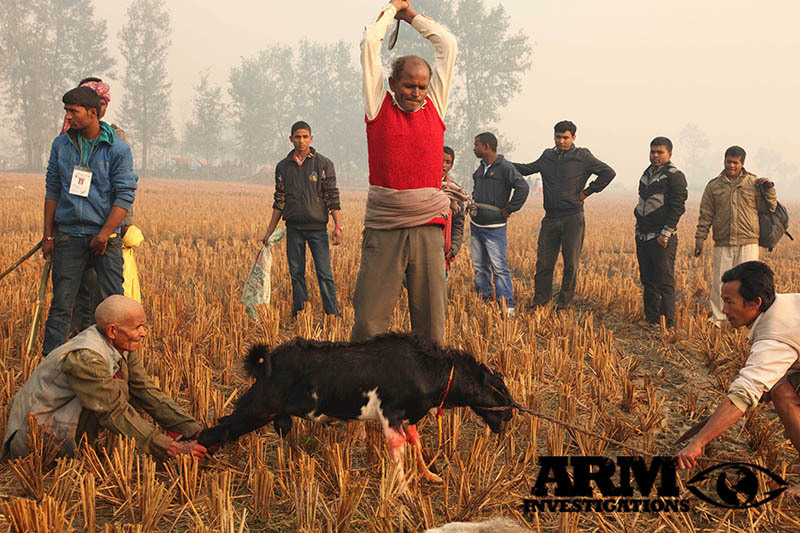 The slaughters and ceremonies involved some of the most disturbing and primative fashions that even shocked ARM investigators to their core. 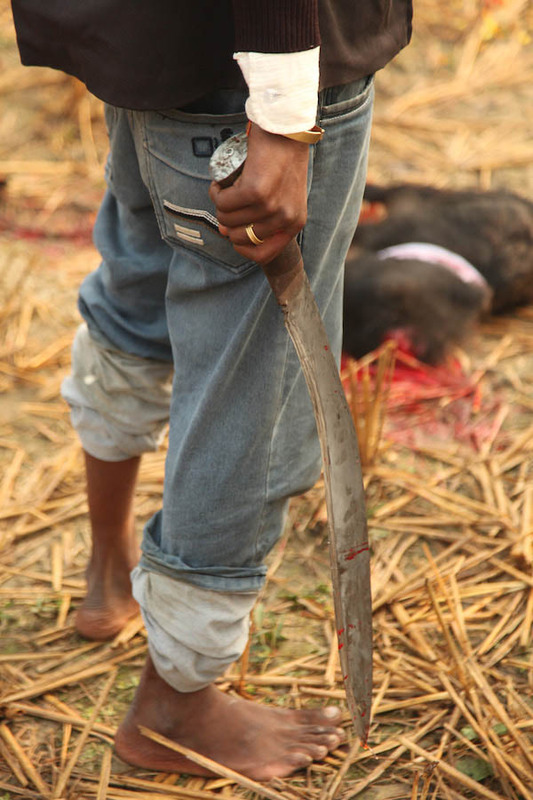 Selected butchers used traditional machete style weapons known as, Kukuri knives. 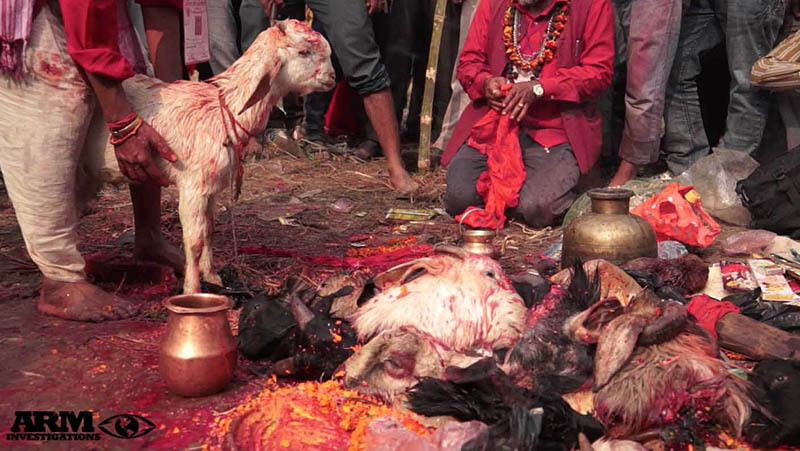 After being paid by people wishing to make an offering, the butchers hacked away at the necks of baby goats (and a variety of other animals) who, terrified, were coaxed down with ropes, their necks stretced out, hind legs anchored out by assistants and blessed with incense, flowers, paint and holy water prior to their deaths. 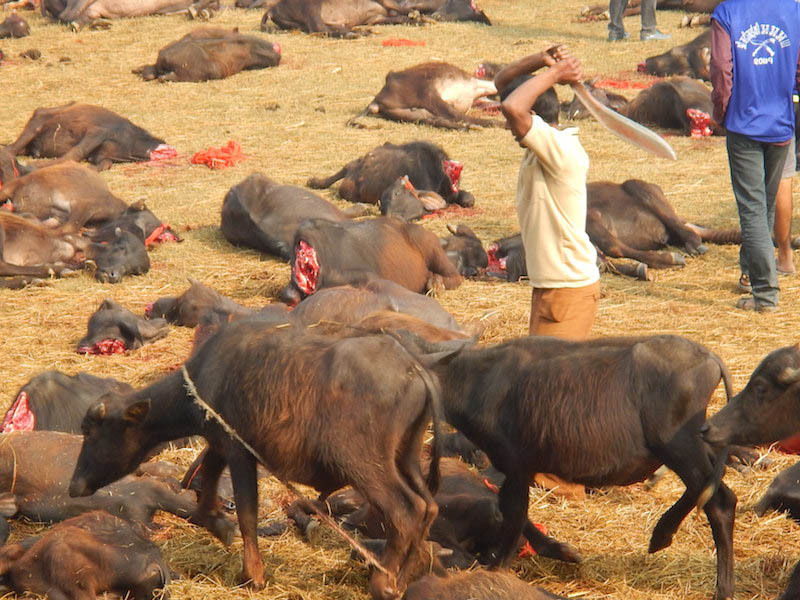 At approximately 8am on the 28th of November following a dawn ceremony, thousands of buffalo were subjected to hours of bloodshed torture by over 400 butchers wielding Kukuri knives in every direction. 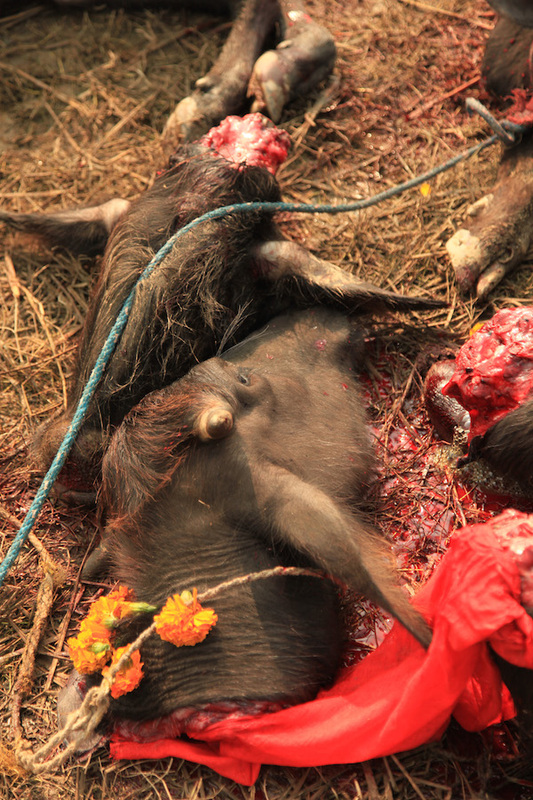 Buffalos are chosen with the belief of being the ‘carriers of demons’ . 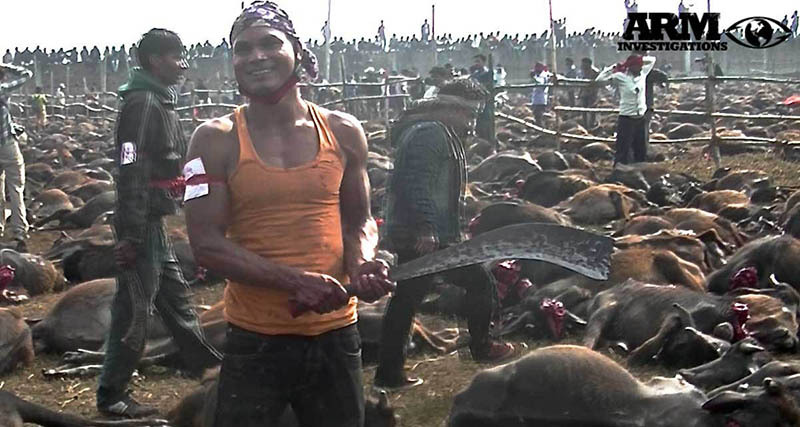 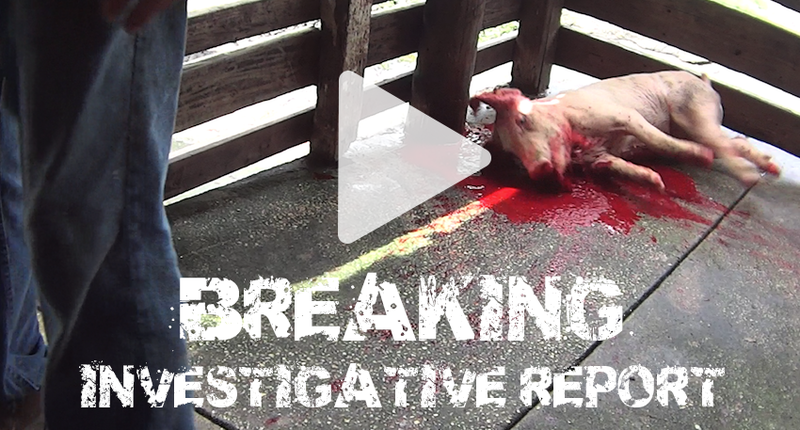 Butchers proudly stated on film to ARM investigators of personally slaying between 70 to 190 animals each. 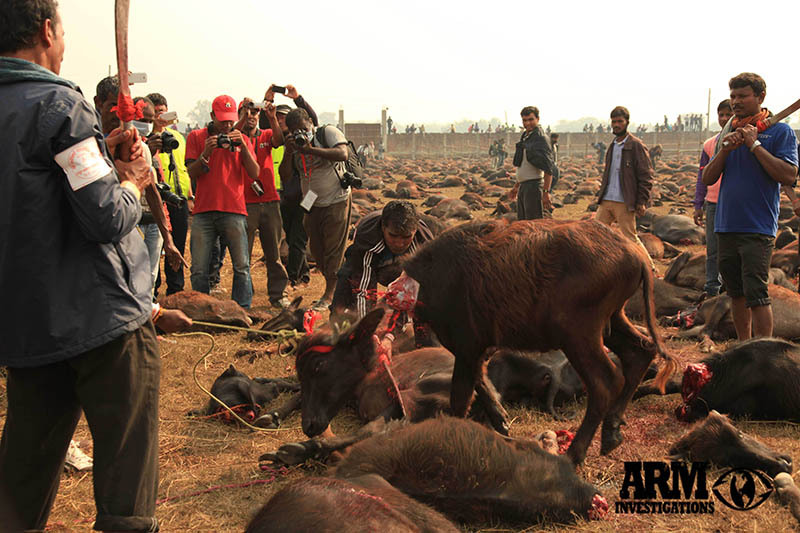 In the aftermath of the event, ARM Investigtors documented hundreds of animals who were still alive as the butchers grew tired of their spree. 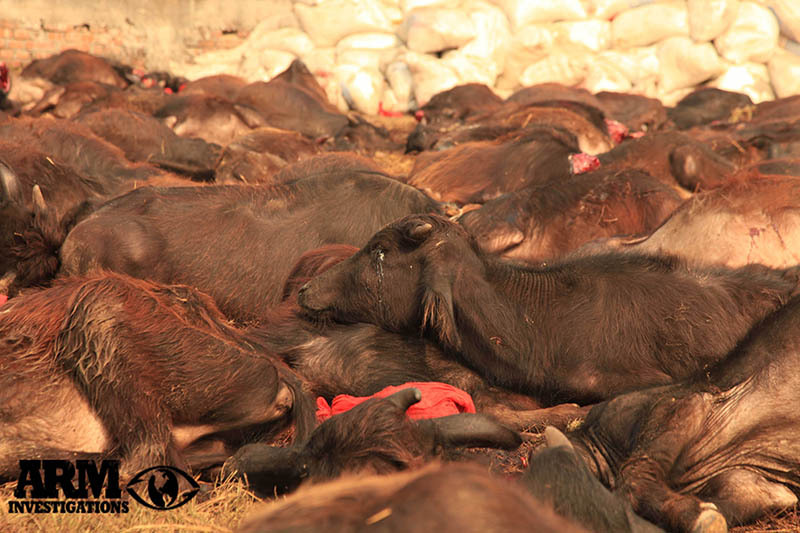 Many had fainted or become paralyzed from fear and shock, leaving them to die drawn out and painful deaths. 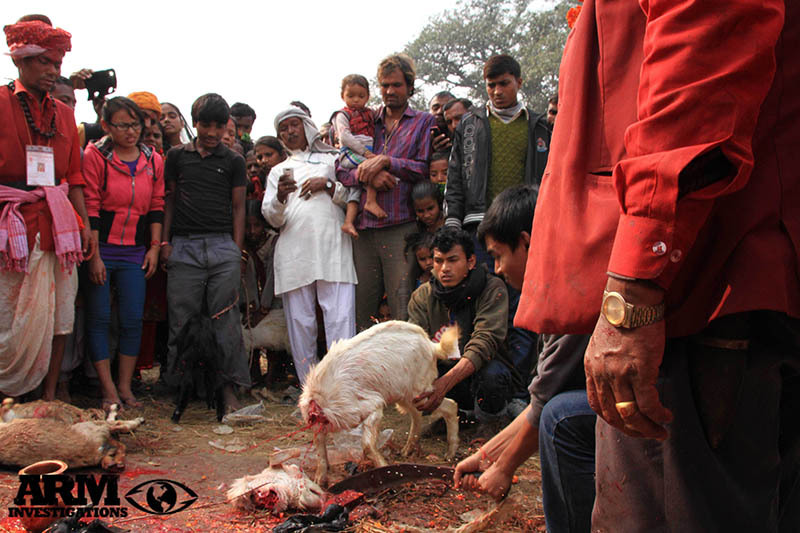 Others were deemed unworthy to sacrifice after limbs were severed and after already shedding blood to the gods, they become useless to even acknowledge and were left alone to stumble throughout the mass piles of dismembered bodies- baby calves shaking and wailing- crying out for their mothers. 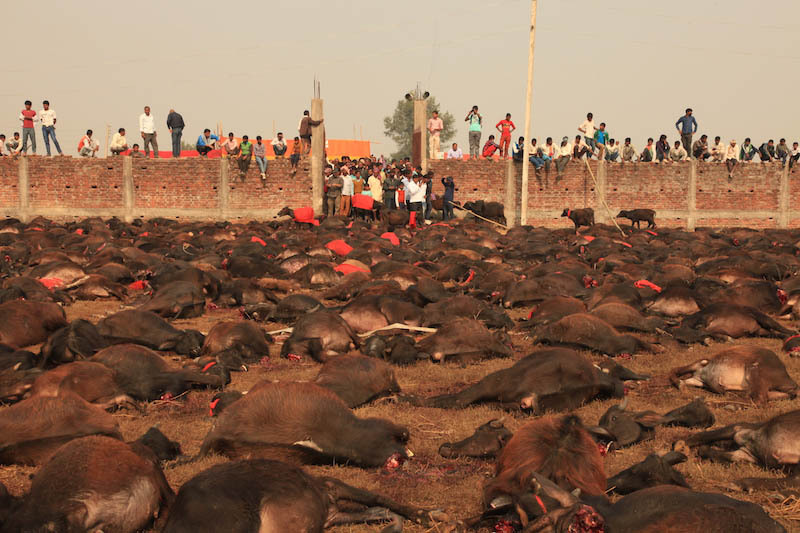 The close of the animal sacrifices two days later, ended with the burying of all of the buffalos heads in a large pit, whilst the rotting remains of the decomposing bodies filled the air. 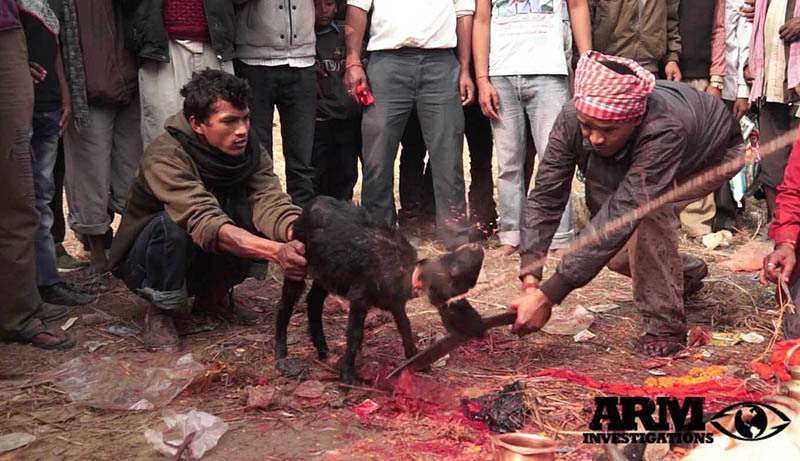 ARM Investigators witnessed animals being tortured and slaughtered freely in the presence of children as young as two years old, throughout the festival amidst a surreal suurrounding enviornment of ferris wheels, food booths and entertainment – merged into one big celebration. 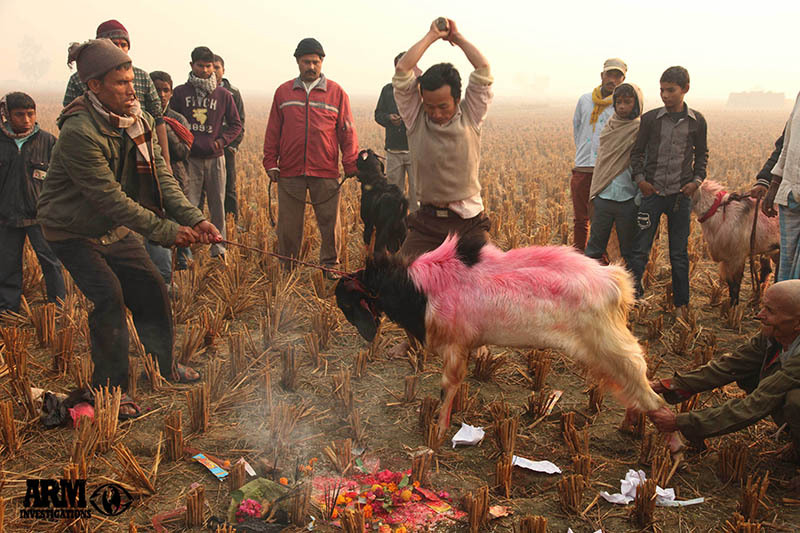 Disturbing in the least but also creating a degenerative and desensitized example that these forms of animal cruelty and abuse are acceptable for future generations, masked as tradition. 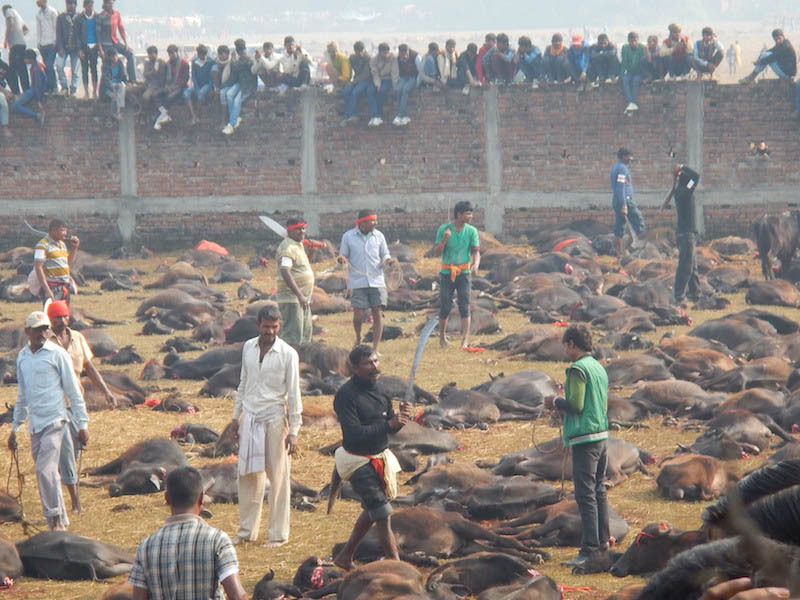 Aside the unimaginable animal cruelty, the festival also bought about extreme danger and hazards to the public. 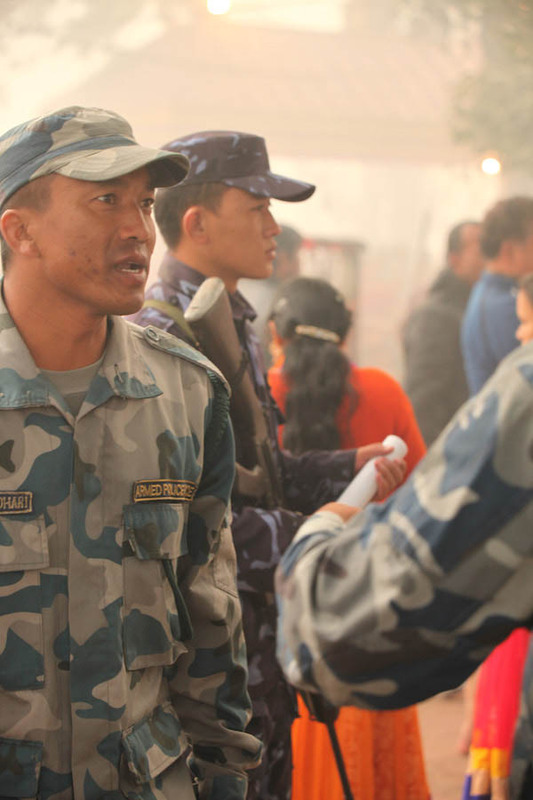 Although crowds were duefully monitored by heavily armed Nepalese police, the chaos of two million attendess caused near riots and stampedes. 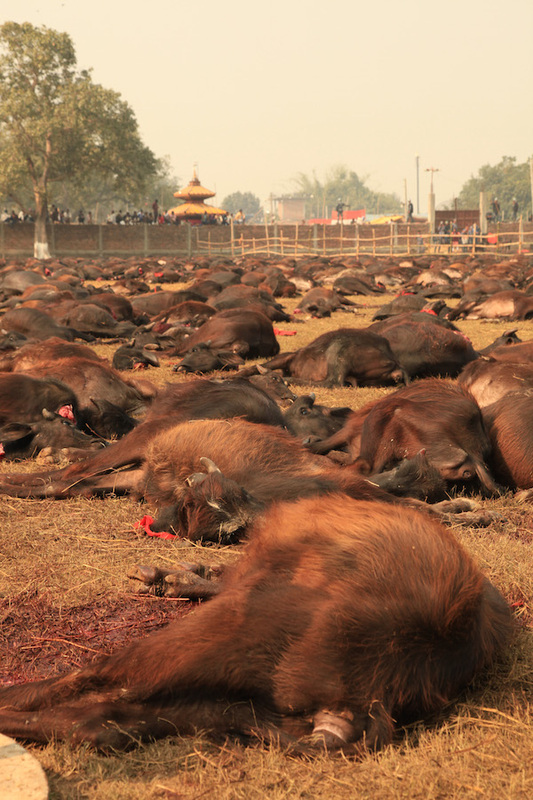 Several people were crushed to death during the frenzied kiling sprees. 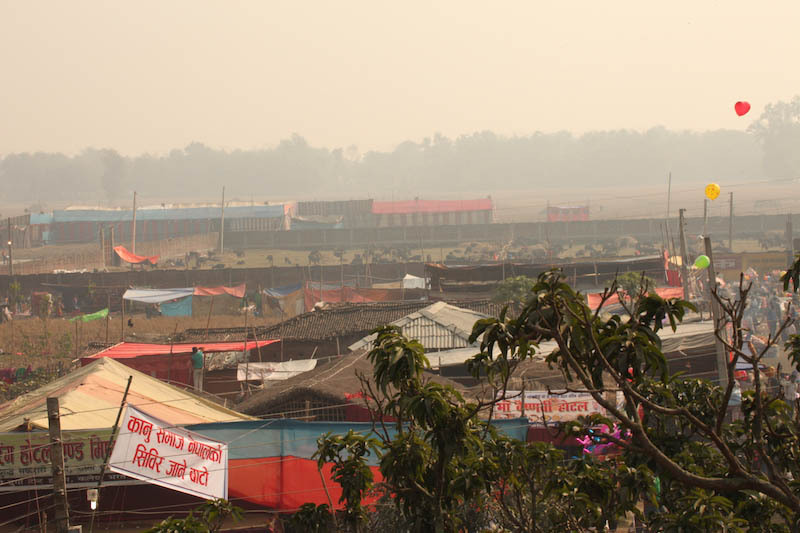 It is evident that a tainted governing and presence of corruption has clearly formed around the Gadhami Festival since the last festival in 2009, which had always been a much more freely, public and less restricted public event during the previous years. 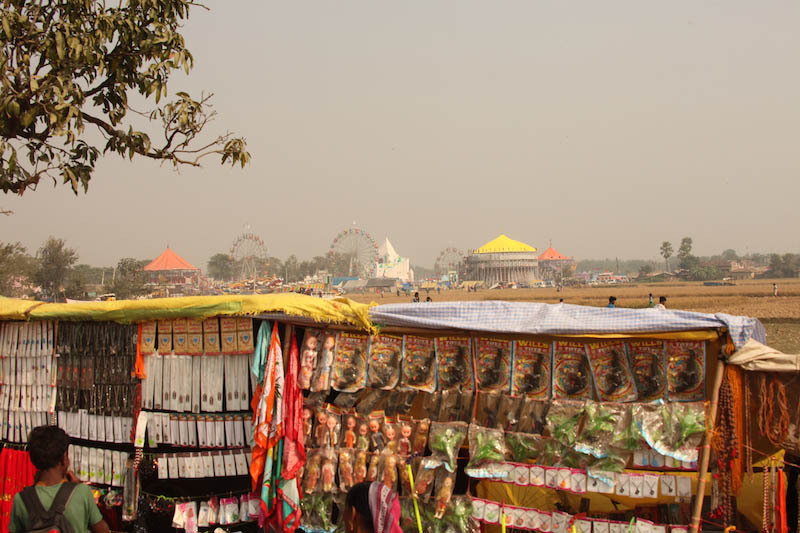 However, this year the committee who overseas the festival appeared to have had a revelation about generating a remarkable profit out of this highly celebrated ‘religious’ event. 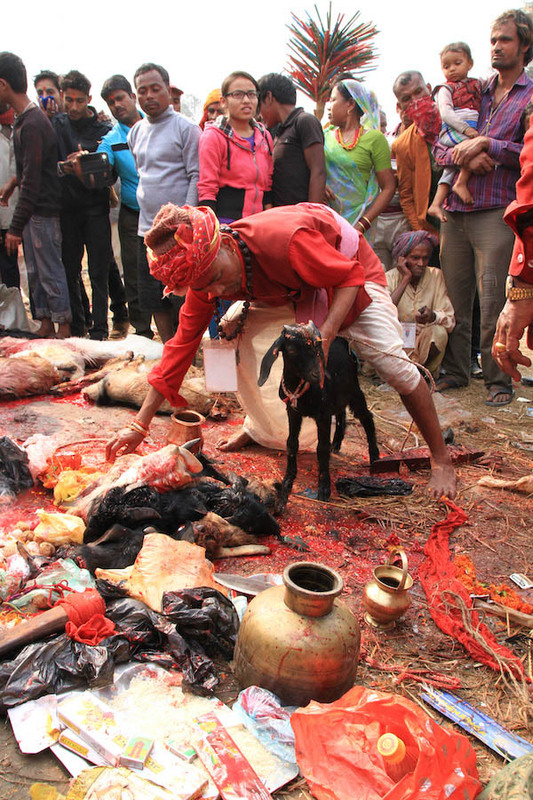 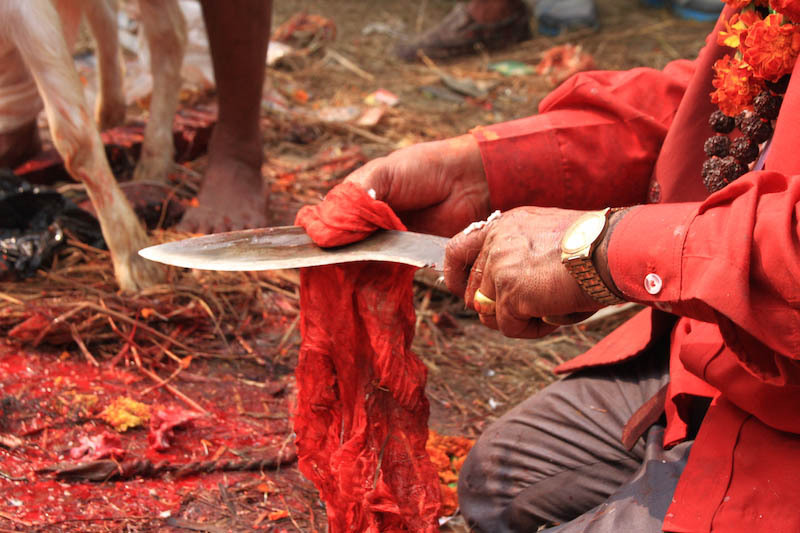 Many people believe that the comittee is now attempting to rob the underprivledged people of Nepal and India of their tradition of previously feeding their families from the meat of the slaughtered animals and using the hides for their own shelter and clothing. 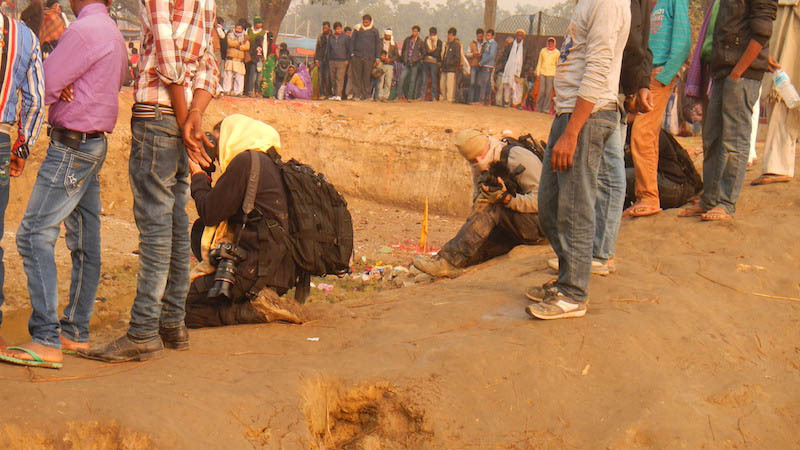 This became clear when the comittee projected fears of having this Hindu driven tradition recieving negative atention and were extremely nervous and concerned about any bad media getting out about the festival, however it appears their concerns lay more within being discovered about making money from peoples faiths and traditions, as was evident in ‘threats’ that were made to our team members if ‘the wrong message’ was portrayed. 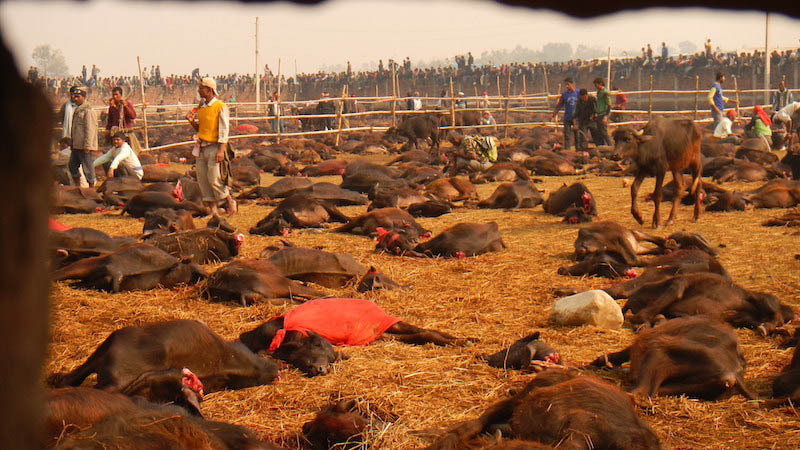 Due to exposure of the comitees intention to have contracts fulfilled on collecting the meat and skins of the buffalo and sold to local slaughterhouses and tannerys for profit, a last minute descion allowed locals to strip meat from the corpses of the buffalo for their own use. 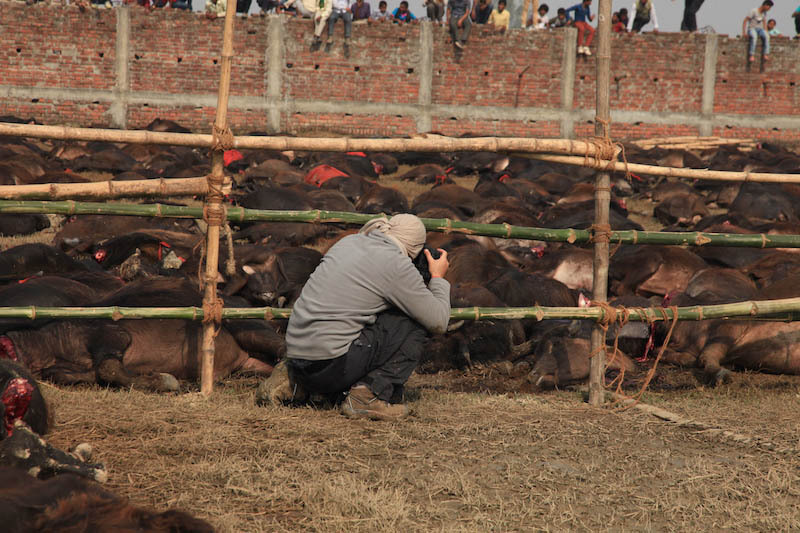 ARM did however document contractors collecting buffalo hides once the crowds dissipitated. 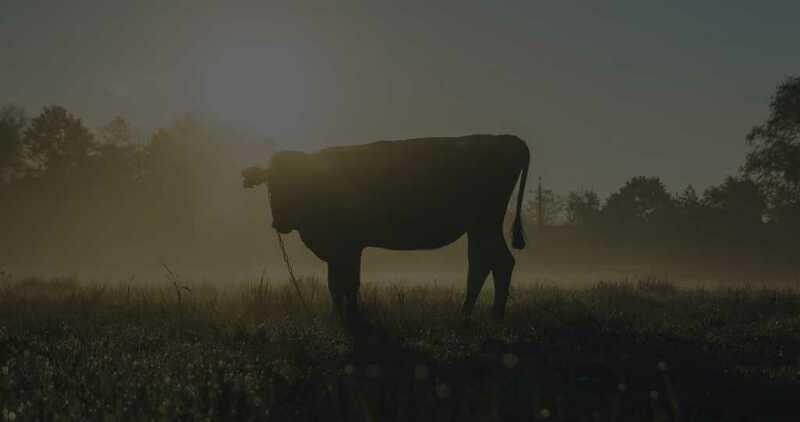 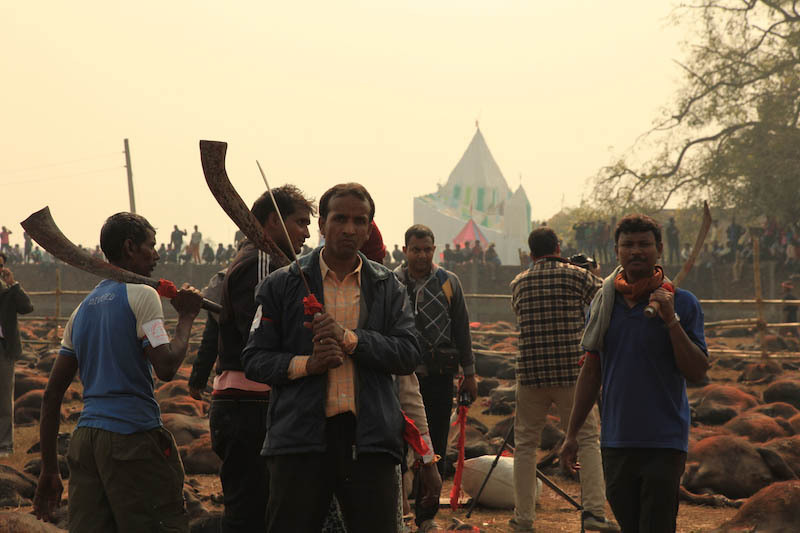 A grand movement in this tradition is rapidly evolving following National and International pressures of animal activist organizations who attempted to halt this years festival. 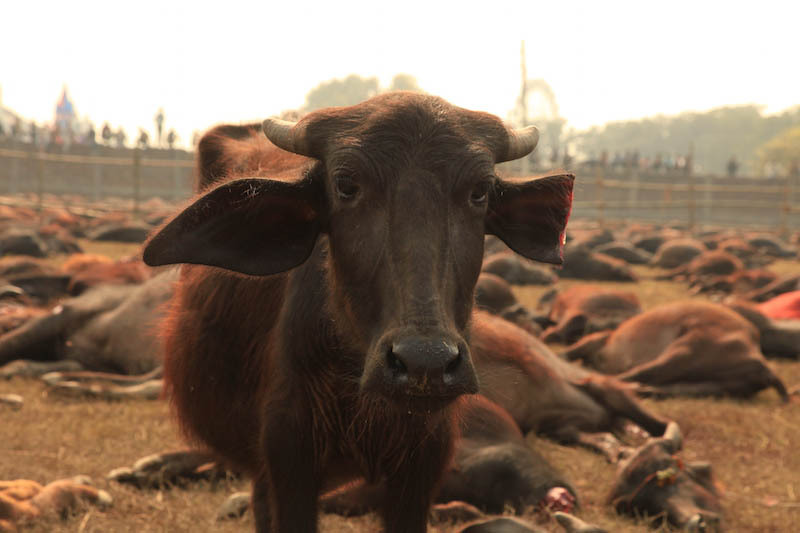 India’s Prime Minister, Narendra Damodardas Modie, also enforced a last minute Supreme court ruling to ban the live import of animals into Nepal where over 70 percent of the animals which are used at Gadhami, are believed to have originated from. 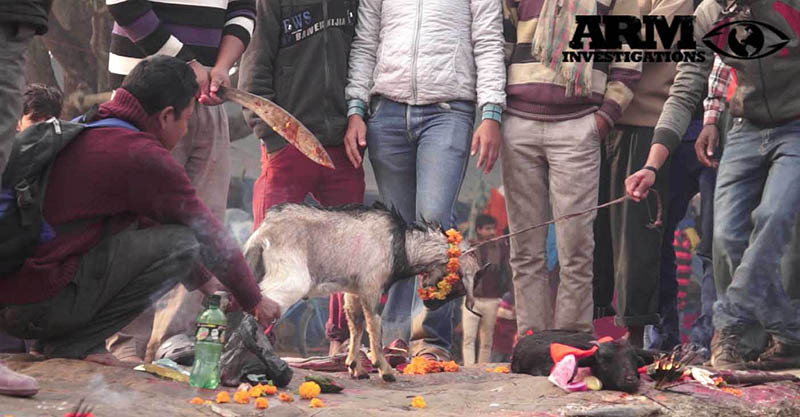 Over 2500 confiscations of animals and 114 arrests were made at the border in it’s efforts to miinimize the number of animals sacrificed at the event. 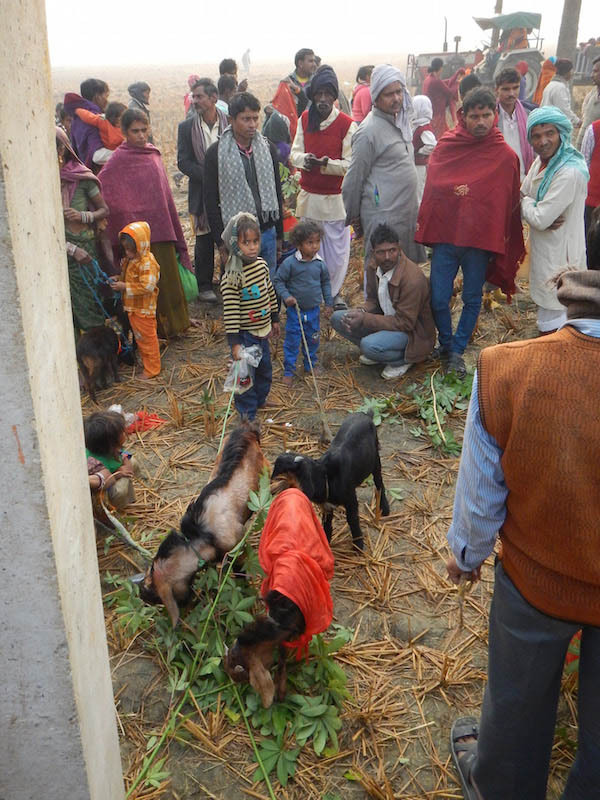 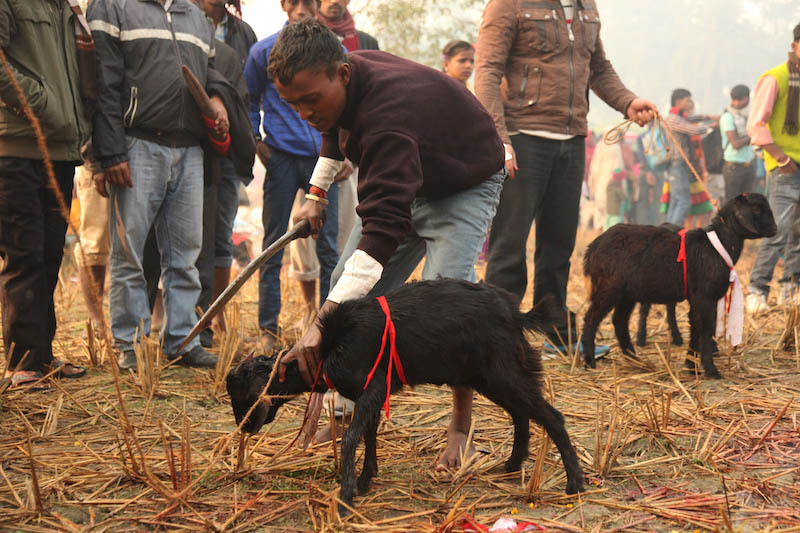 No solid animal protection laws are currently being set or enforced in Nepal and it is with determined efforts from ARM, and other reputable organizations, that the Government of Nepal will follow suit with some of the laws that have already been established in neighbouring countries, such as in India. 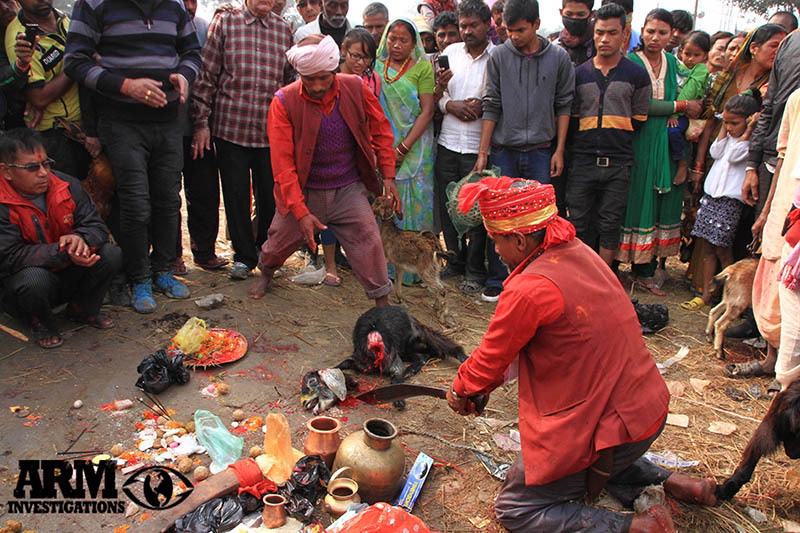 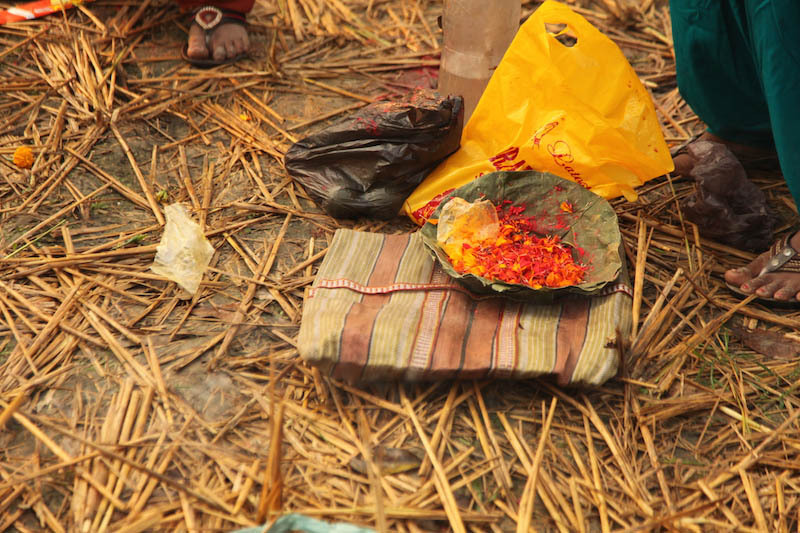 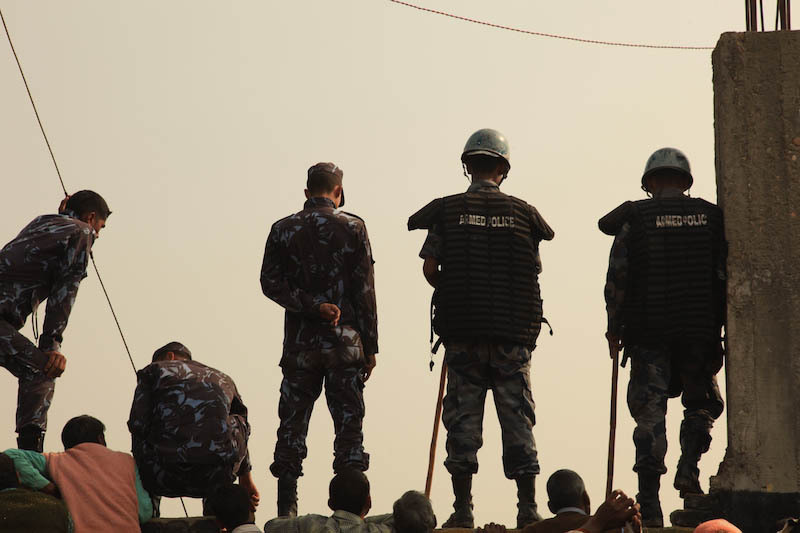 Whilst uncovered in Nepal, ARM also learnt of several other currently unexposed festivals and ceremonies which are equally as dire as the Gadhami Festival and unknown to the rest of the world. 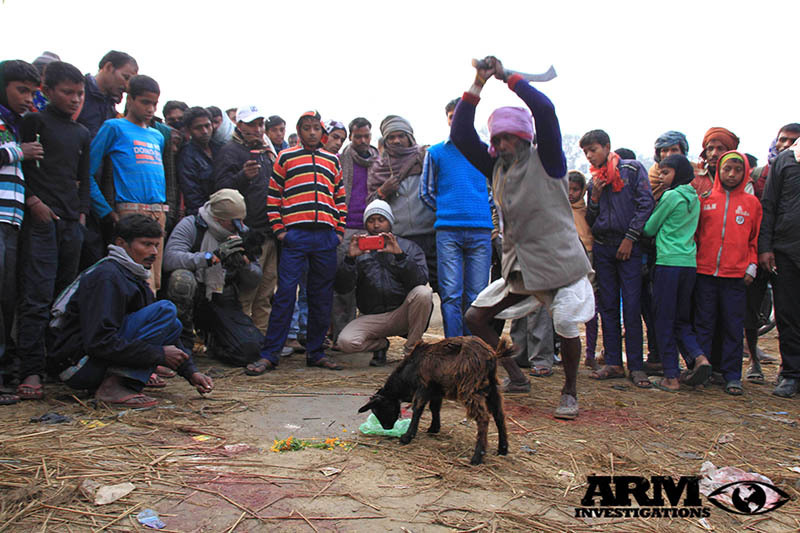 ARM will be conducting further investigations to uncover these practices in the near future. 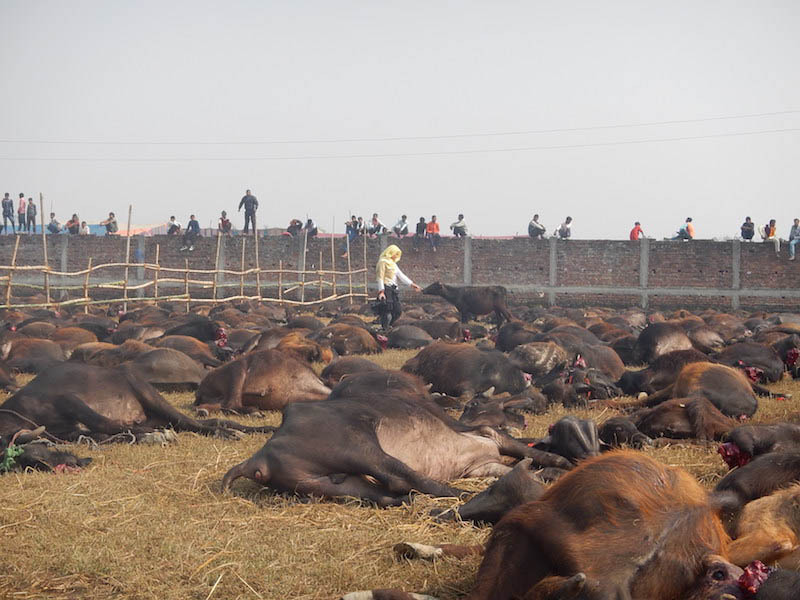 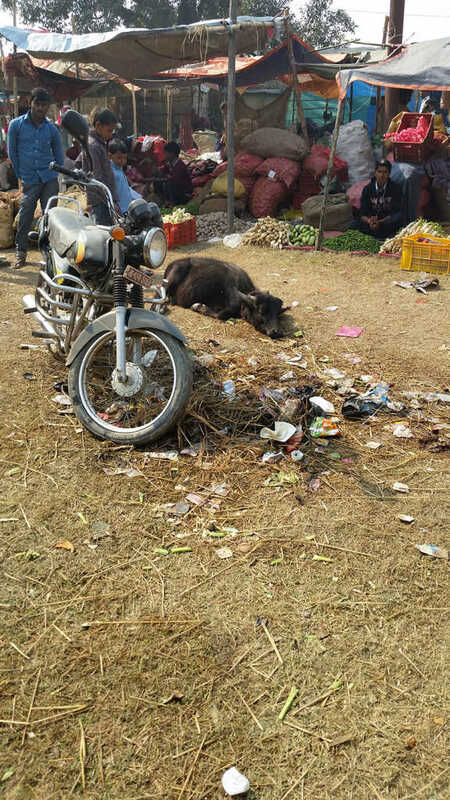 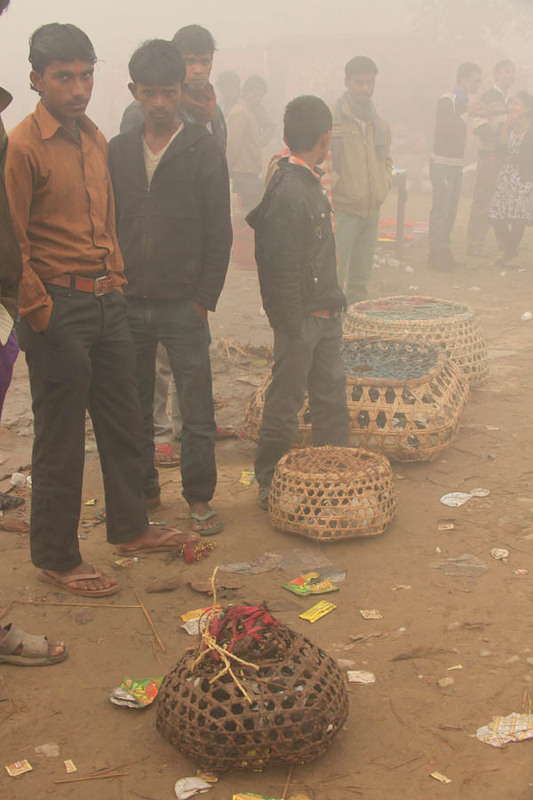 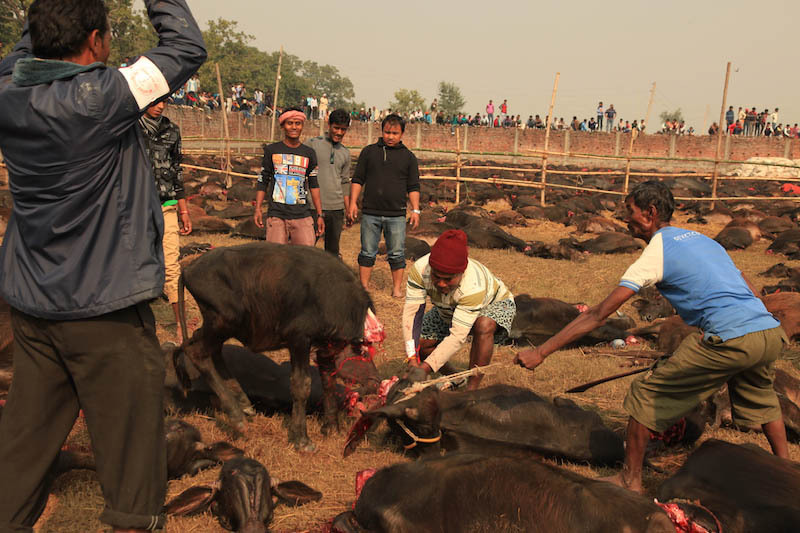 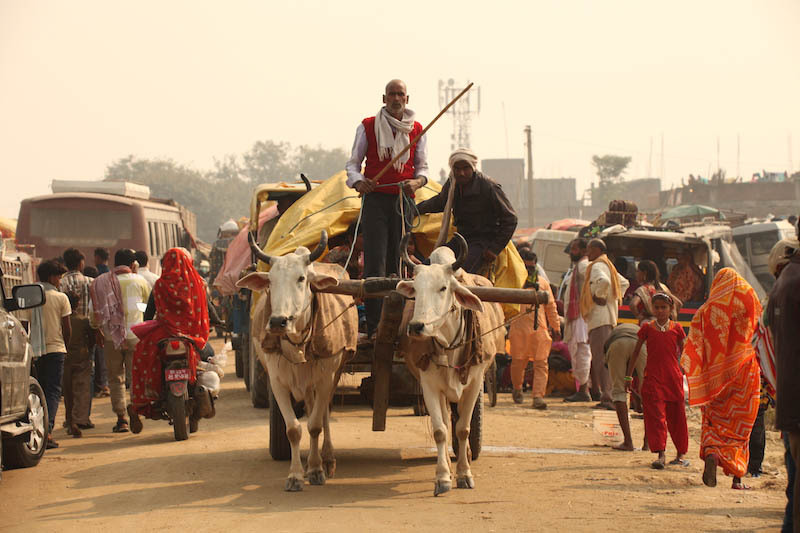 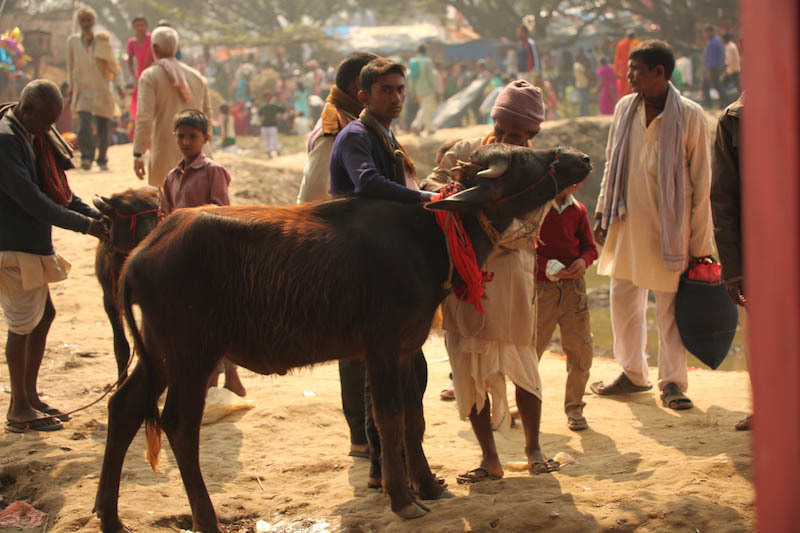 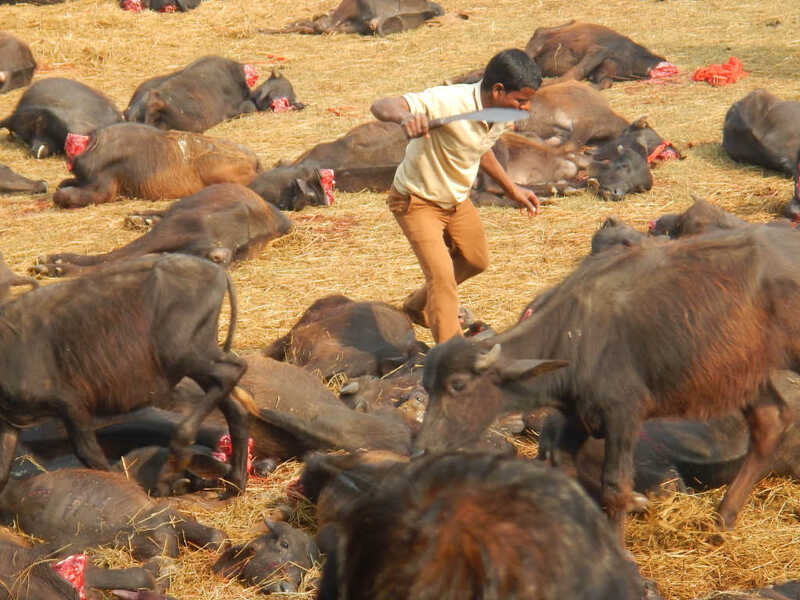 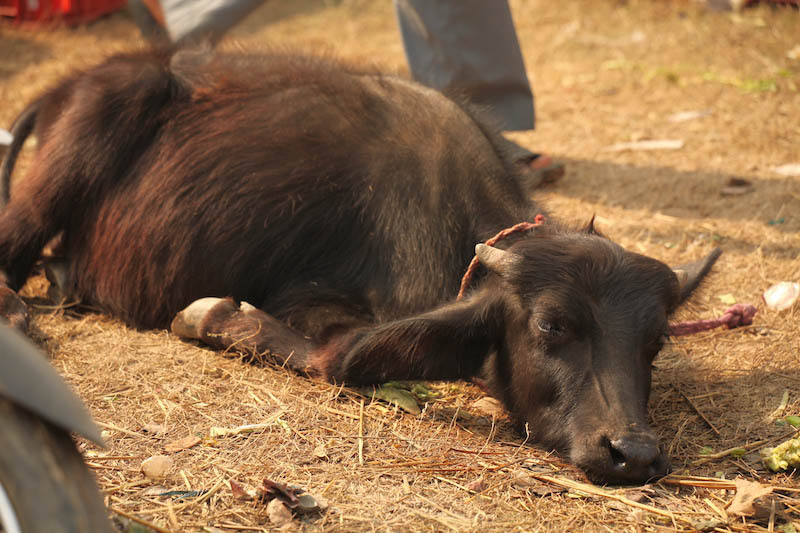 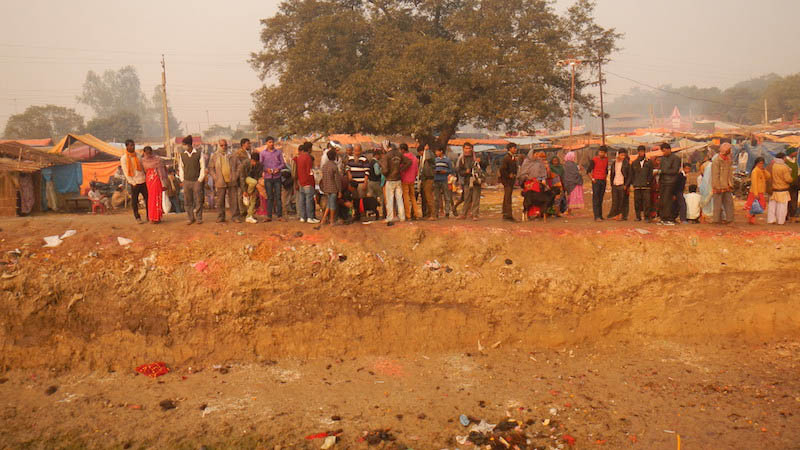 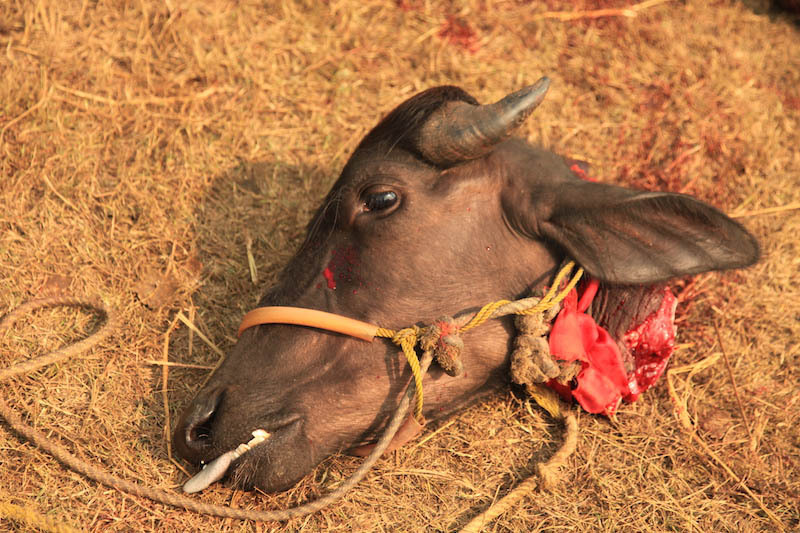 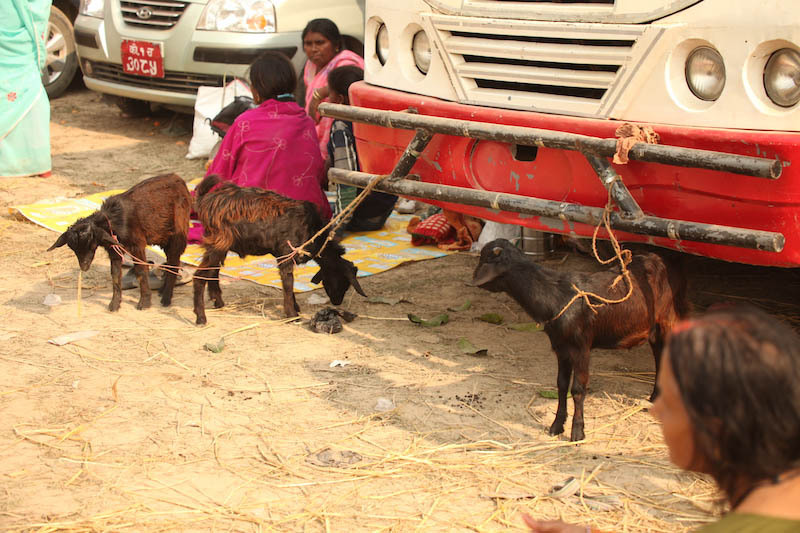 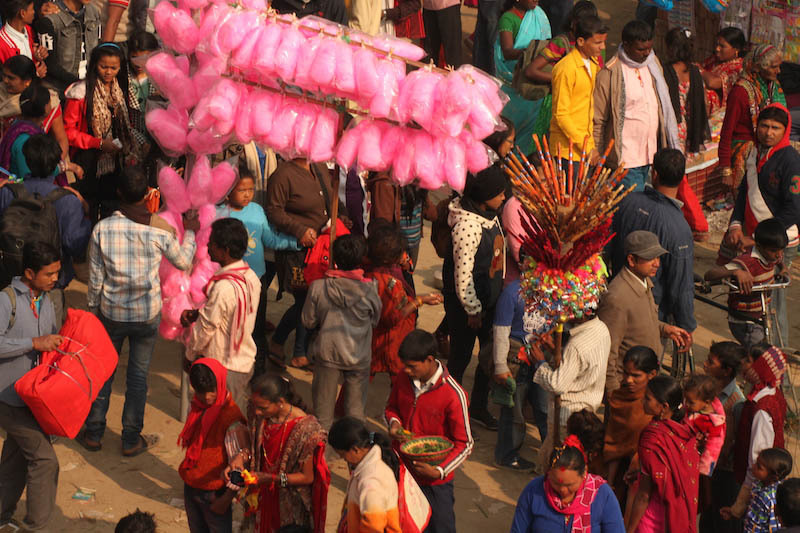 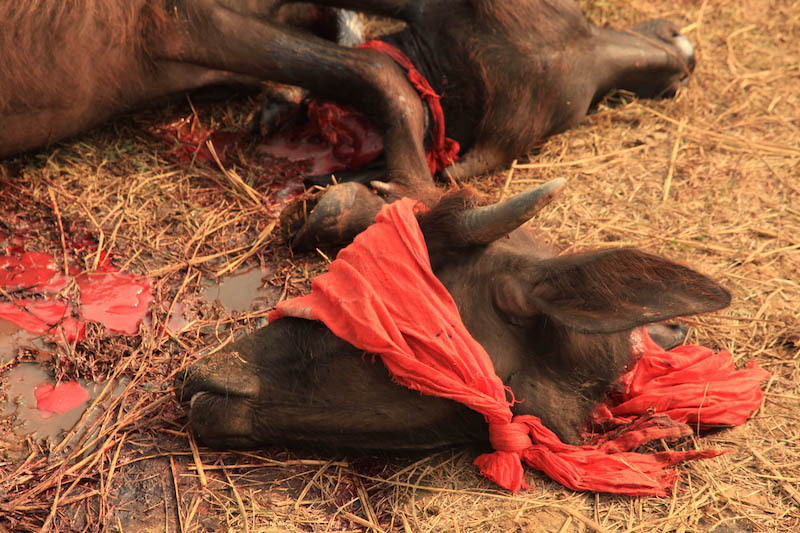 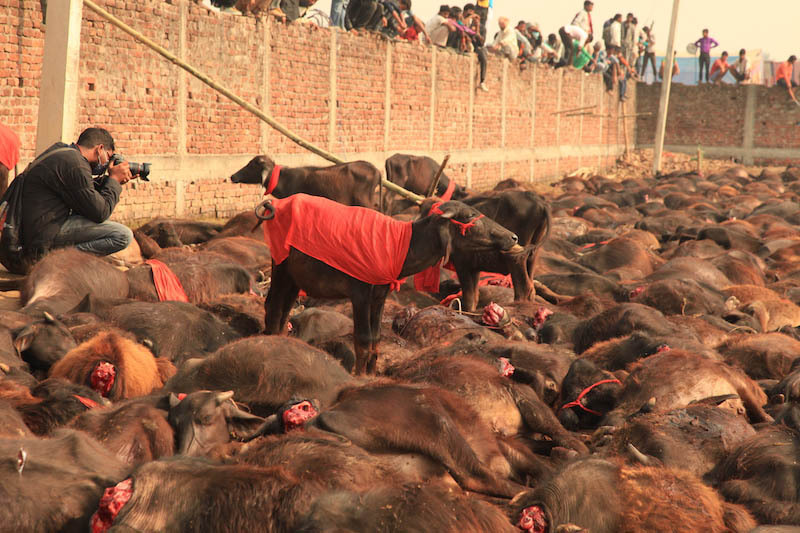 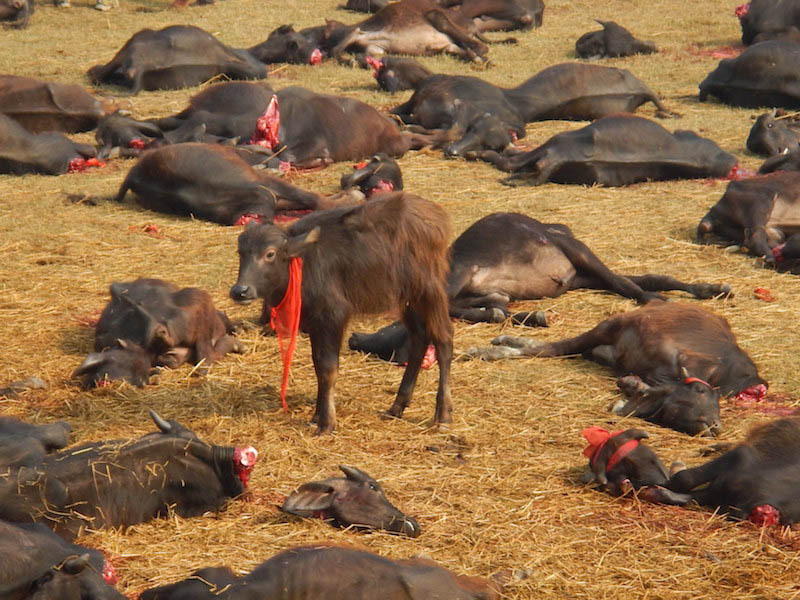 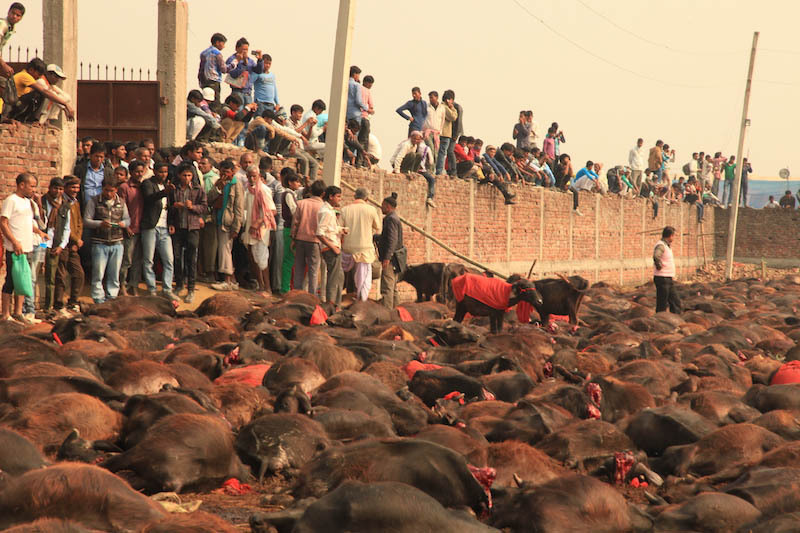 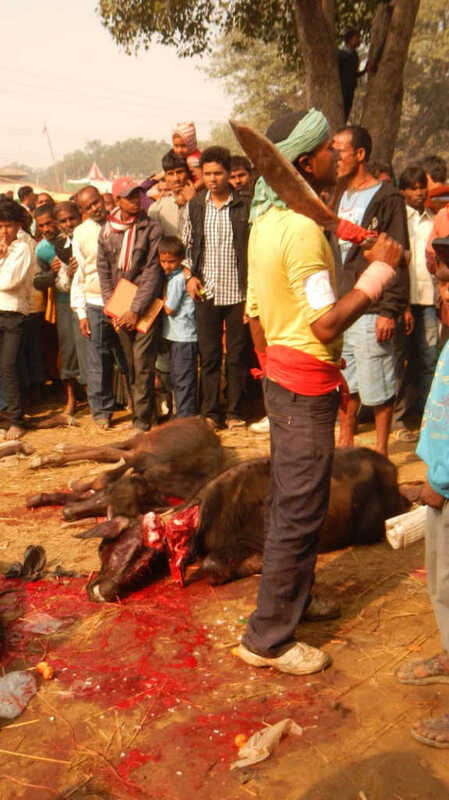 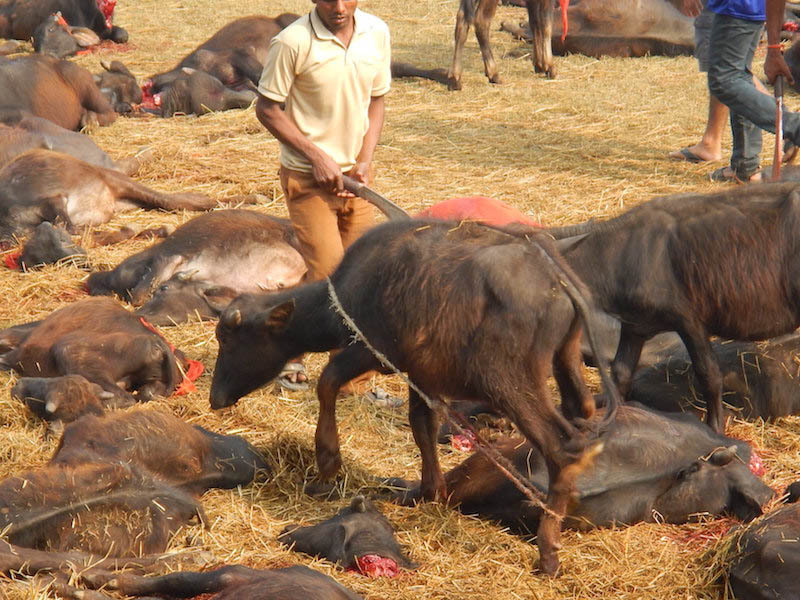 ARM’s goal is to aid in projecting a widespread global exposure of the extreme animal cruelty of The Gadhimai Festival in its efforts to bring about a societal gravitation to ensure that animal protection laws and education are instilled so that another Gadhamia festival does not follow in 2019. 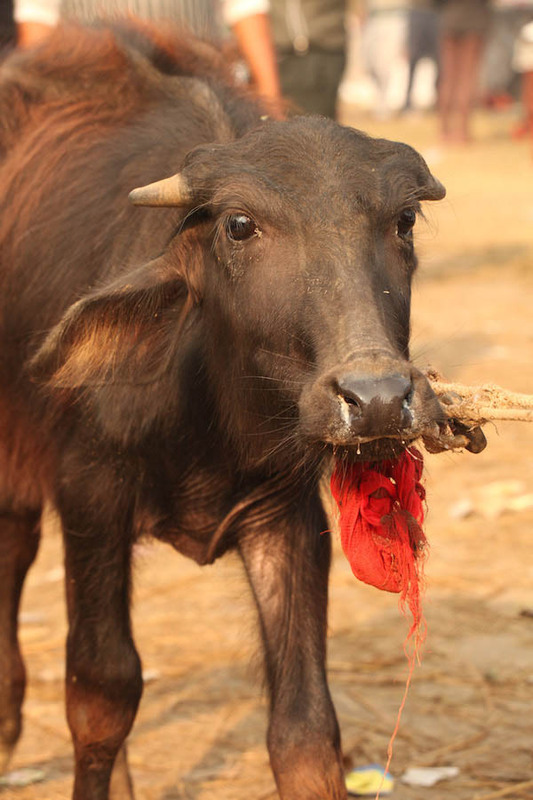 (Due to the size of this album, please allow a few moments for this gallery to load).